Book Lots 251-300 - Mike Clum Auctions Inc.
​​251. 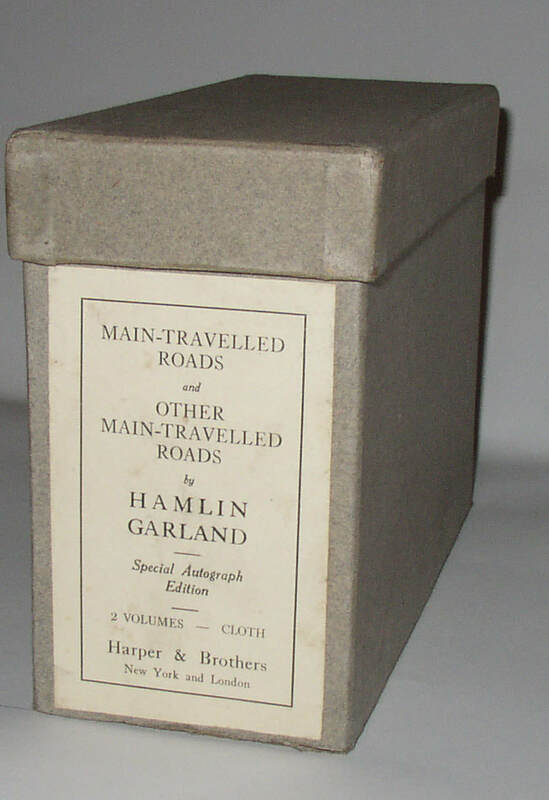 Hamlin Garland, Main-Travelled Roads, Special Autograph Edition in publisher’s box. New York: Harper & Brothers, . Other Main-Travelled Roads appears to be a 1910 first edition, with no date code, although there is no date on the title page; Main-Travelled Roads has the Harper D-Q date code for April 1916. Main-Travelled Roads has a Garland signature page (there is offsetting from the signature to the preceding page, so it seems to be an actual signature; the box has a publisher’s label reading “Special Autograph Edition.” The box is of an unusual form, in which the books seem designed to stand either on their fore-edges or on their spines, with a separate lid. Complete with box, lid, and original glassine dust jackets and Harper/Garland bookmark. Unusual and fine. Condition: Books are like new; box has some incipient splitting but still holds firm. 252. 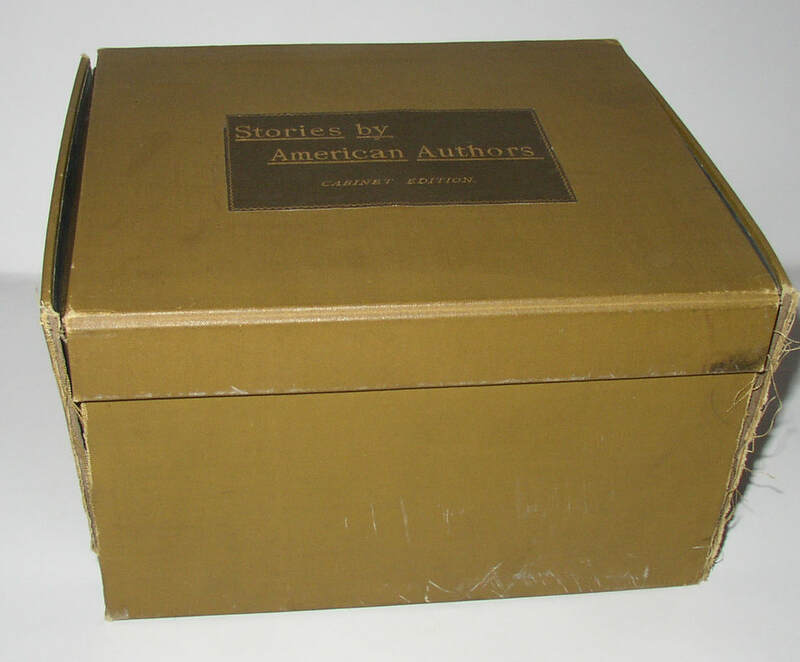 Stories by American Authors, Cabinet Edition, in scarce original publisher’s box. Condition: The numbers 482 in ink on the front free end-paper of volume 1; a pencil price for the set is also in volume 1. Otherwise, one would think the books had virtually never left the box. Box is split almost all the way down the two front corners. 253. 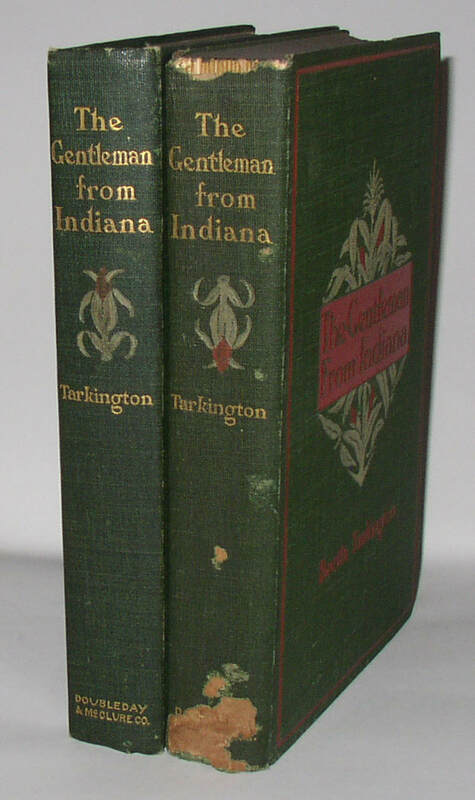 Booth Tarkington, The Gentleman from Indiana, 2 1st ed. copies, 1 signed and inscribed. New York: Doubleday & McClure, 1899. One copy is the first issue, with two errors on p. 245, and with the ear of corn on the spine pointing upwards; The second copy is the third issue, with both errors corrected on p. 245, and with the ear of corn on the spine pointing downwards. 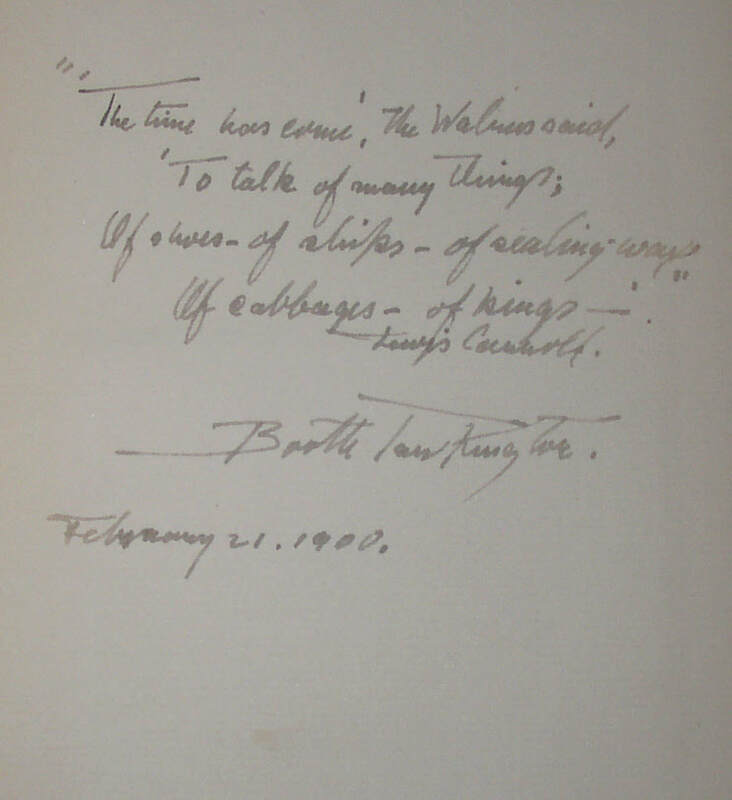 The third issue copy has a fine inscription by Tarkington date Feb. 21, 1900, in which he quotes (from memory, it would seem) from Lewis Carroll’s “The Walrus and the Carpenter,” which is also the title of Chapter IV of the novel. The popular author’s first novel. Condition: First issue copy about VG, with original owner’s inscription dated Nov. 1899. Inscribed copy about Good minus, with loss to spine (as shown) and with splitting at the front hinge almost to the point of separation. Sale Estimate: $100-200.00 for both. 254. 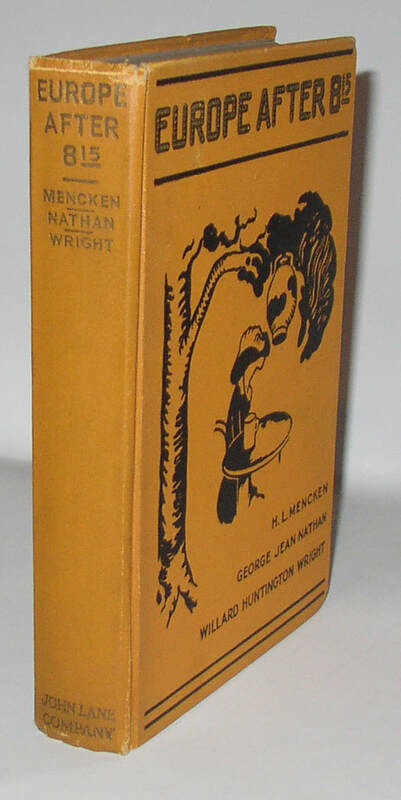 H L Mencken, George Nathan, Willard Huntington Wright, Europe After 8:15, signed 1st ed. New York: John Lane, 1914. Signed and inscribed in 1923 by Wright (who would go on later to write the Philo Vance mystery novels, under the pseudonym of S S Van Dine). Wright has also inked the initials of the authors of the various portions of the book alongside the list of contents on the Contents page. Orange boards printed in black (apparently the second state of the binding); decorations by Thomas Hart Benton, his first work in book illustration. No dust jacket present. Condition: About Very Good, with some light wear. 255. 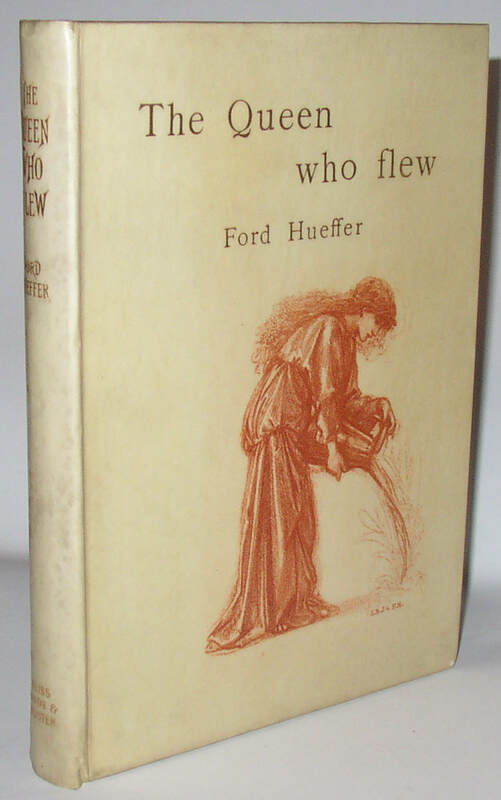 Ford Madox Ford/Hueffer, The Queen Who Flew, signed limited first edition. London: Bliss, Sands & Foster, 1894. 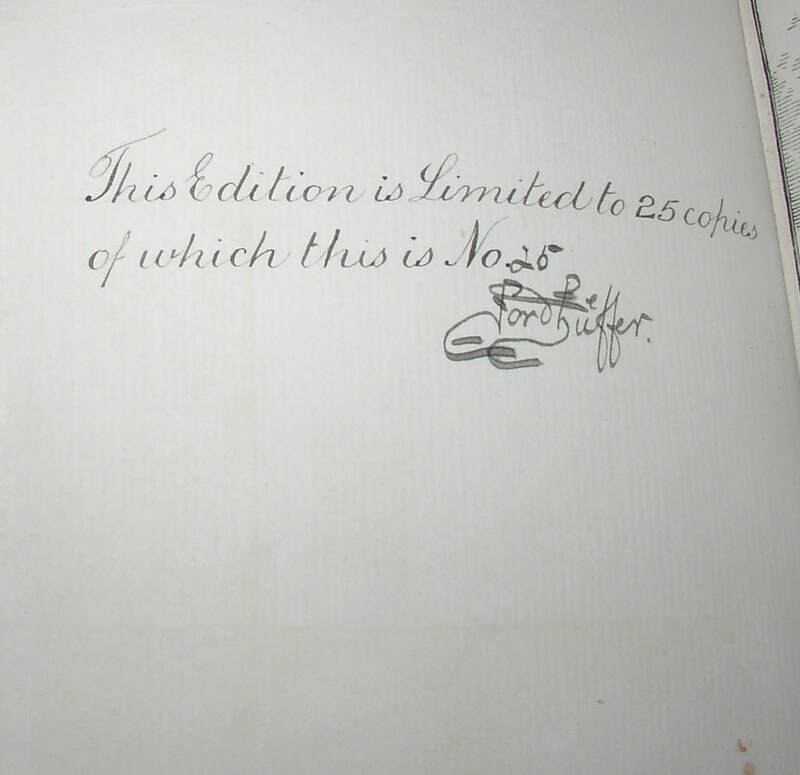 One of only twenty-five copies of this signed limited edition; this copy is number 25, and Hueffer has signed it on the colophon page. Frontispiece by Edward Burne-Jones; the same image is also printed on the vellum binding on the front board. The author’s name is spelled “Huffer” on the title page, but “Hueffer” (as it normally appears) on the front board and on the spine. 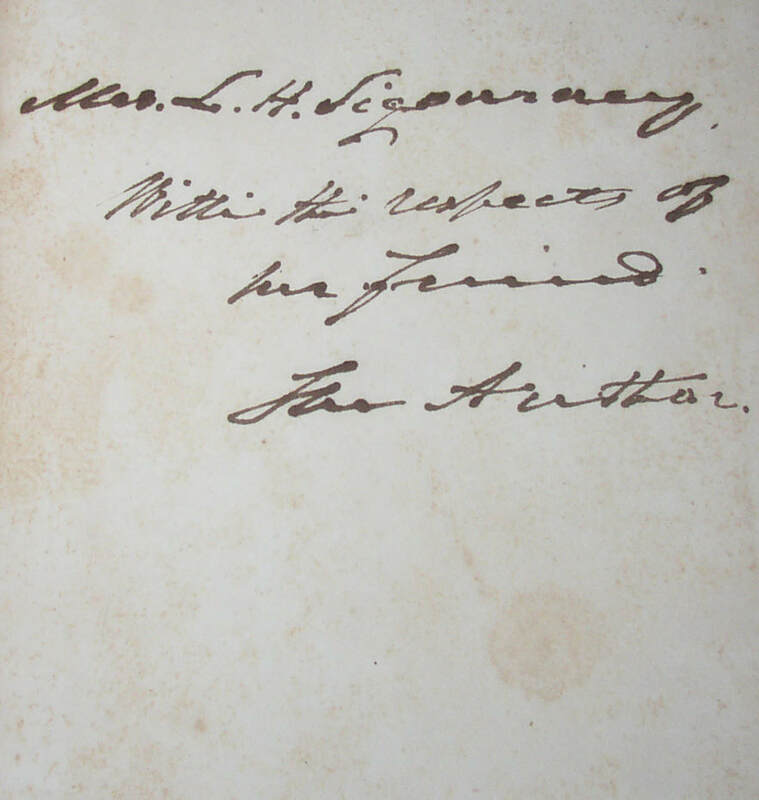 A scarce early title from this author, very difficult to find in the signed limited vellum-bound issue. Condition: Mild discoloration to the vellum: Near Fine. Pages uncut and unopened. Housed in a custom slip-case. 256. 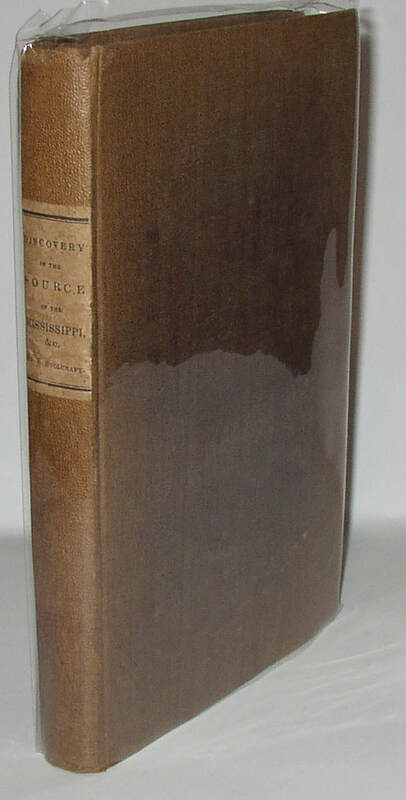 Henry R. Schoolcraft, Narrative of an Expedition through the Upper Mississippi (1834). New York: Harper & Brothers, 1834. Schoolcraft’s account of the discovery of the actual source of the Mississippi River in Lake Itasca in 1832. Maroon cloth boards faded mostly to tan, with original printed paper label. Two folding maps and three smaller maps tipped in; includes a lengthy appendix on Chippewa language. 257. 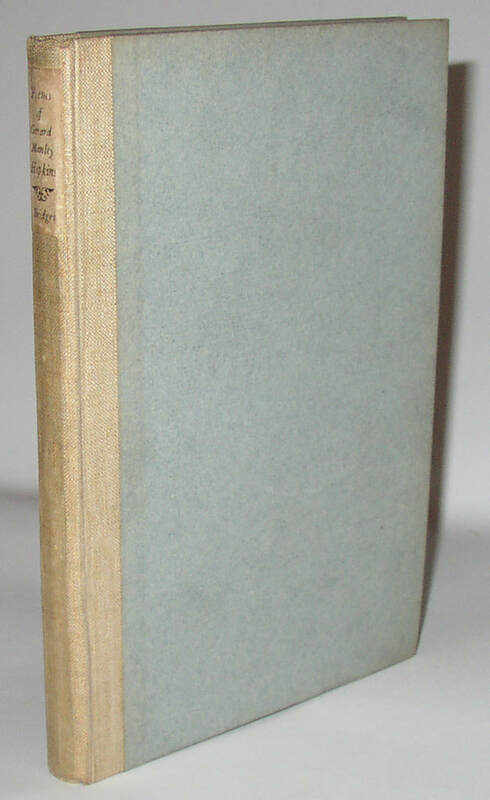 George Bernard Shaw, Buoyant Billions, signed 1st edition in dj. London: Constable, 1949. First edition, number 212 of a total of 1025 copies, here with the original unprinted dust jacket. 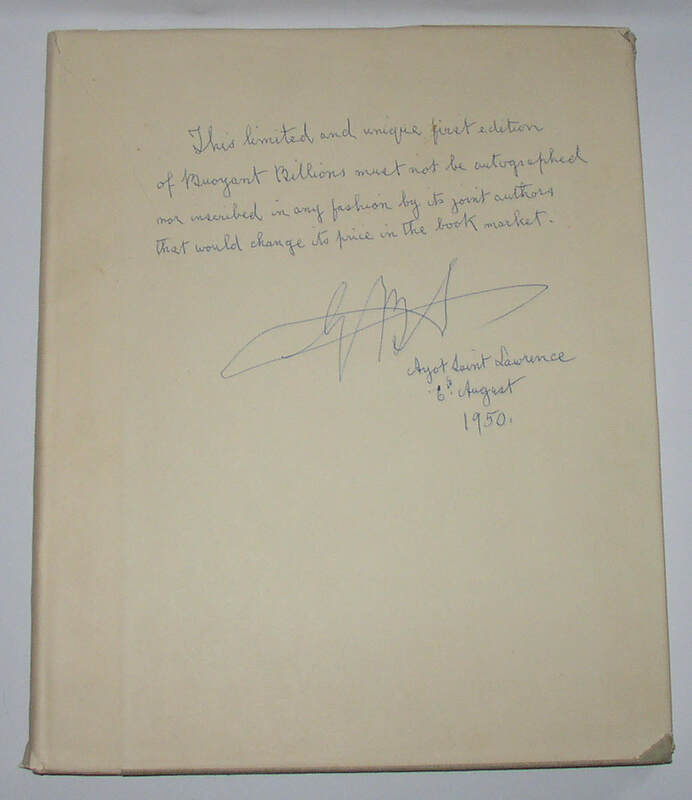 On the front panel of the jacket Shaw has written “This limited and unique first edition/ of Buoyant Billions must not be autographed/ nor inscribed in any fashion by its joint authors/ that would change its price in the book market. 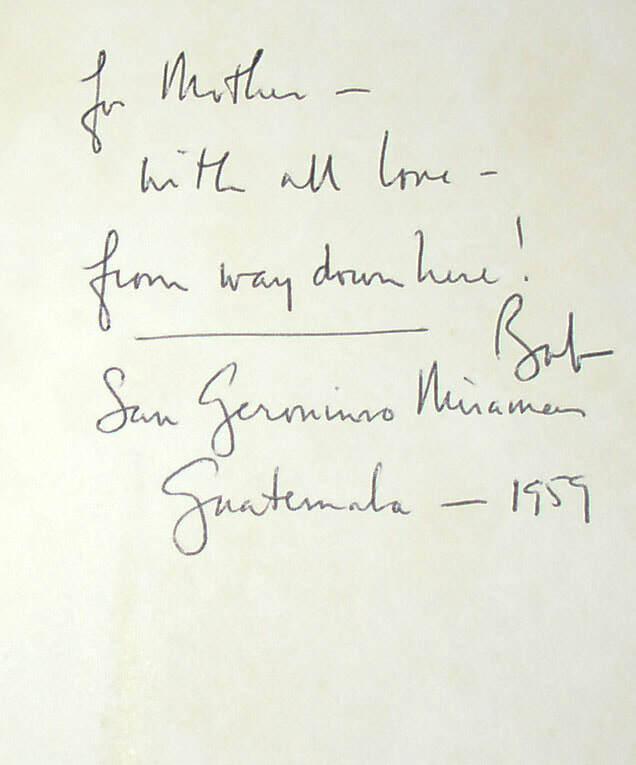 /G B S/ Ayot Saint Lawrence/ 6th August/ 1950.” A wonderful and amusing inscription from Shaw. Condition: outer upper corners of both boards bumped pretty solidly; jacket with some small tears and minor losses; one 5” closed tear extends partway across the front panel, affecting two small words of Shaw’s inscription. 258. 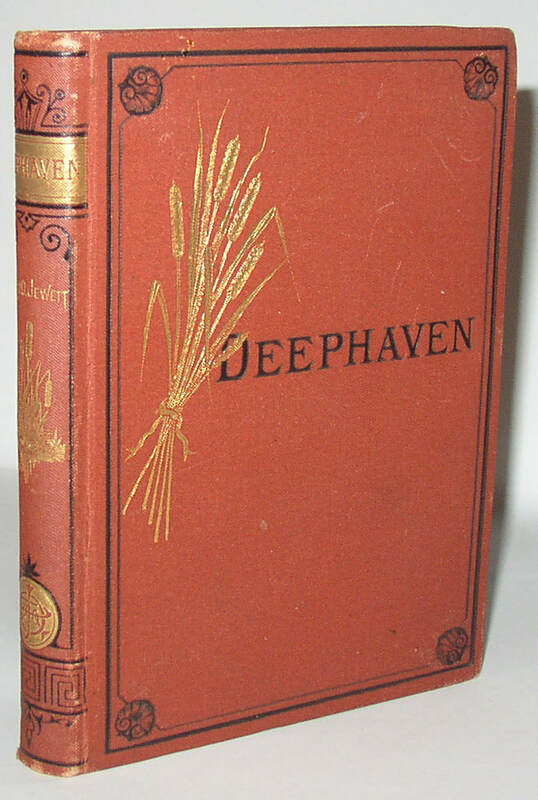 Sarah Orne Jewett, Deephaven, 1st edition, 1877. Boston: James R Osgood and Company, 1877. First edition of Jewett’s first book, with “was” (later changed to “so”) as the last word of line 16 on p. 65, so first state. Difficult to find in any condition, this copy is close to Fine. Condition: light wear to the spine ends, and even lighter wear to the surface of the boards. A couple pencil letters and numbers inside, but no ink inscriptions; hinges tight. 259. 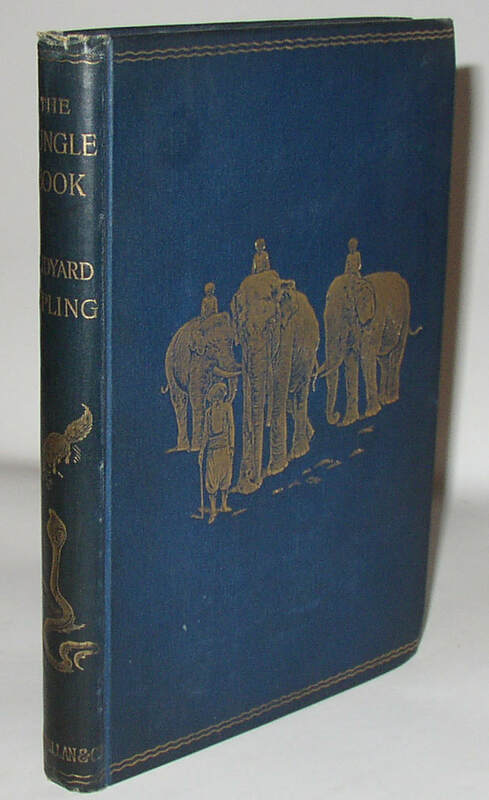 Rudyard Kipling, The Jungle Book, UK 1st edition. London: Macmillan, 1894. A beautiful copy of the first Jungle Book. Collectible condition. Condition: Near Fine: previous owner’s name in ink; minor crimping at ends of spines, and just a touch of turn-in at the tips of the boards. A slight bit of darkening to the gold printing on the spine. 260. 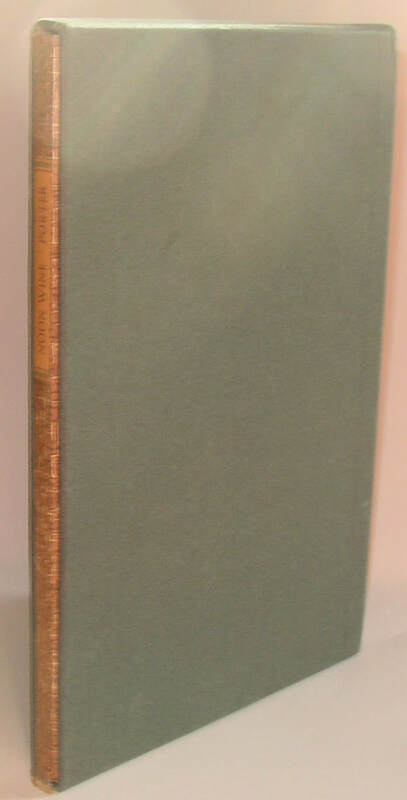 The Poems of Gerard Manley Hopkins, rare 1st edition (1918). London: Humphrey Milford, 1918. Edited by Robert Bridges. Hopkins would prove to be one of the pre-eminent poets of the late nineteenth century; this book, in which his poems were first published is thus an important record of his work, though very scarce. This copy lacks the original dust jacket. Condition: Some darkening to the spine and the edges of the boards; likewise to the end-papers, where it is surely from the glue used. Pages uncut and unopened. Very Good or Near Fine. 261. 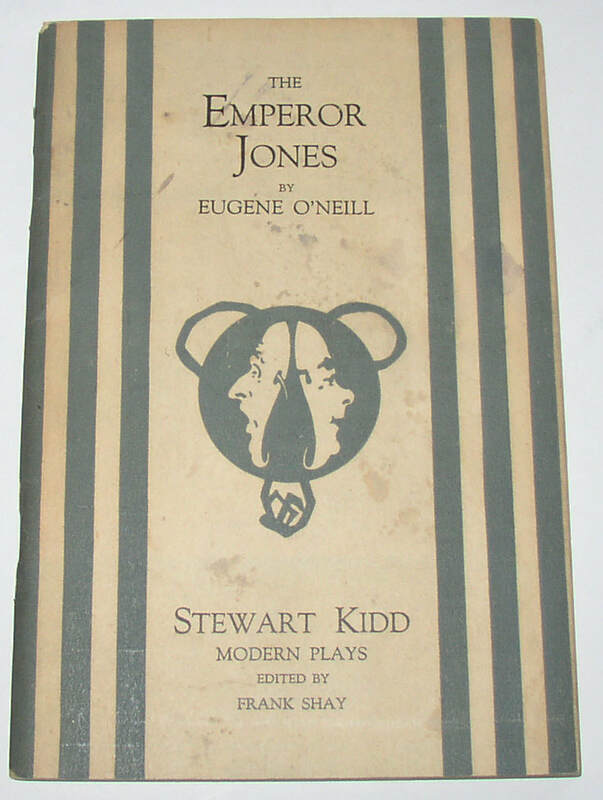 Eugene O’Neill, The Emperor Jones, 1st separate edition, signed by O’Neill. Cincinnati, Stewart Kidd, 1921. This was O’Neill’s breakout play, a major hit, and this book is the first separate publication of the play. 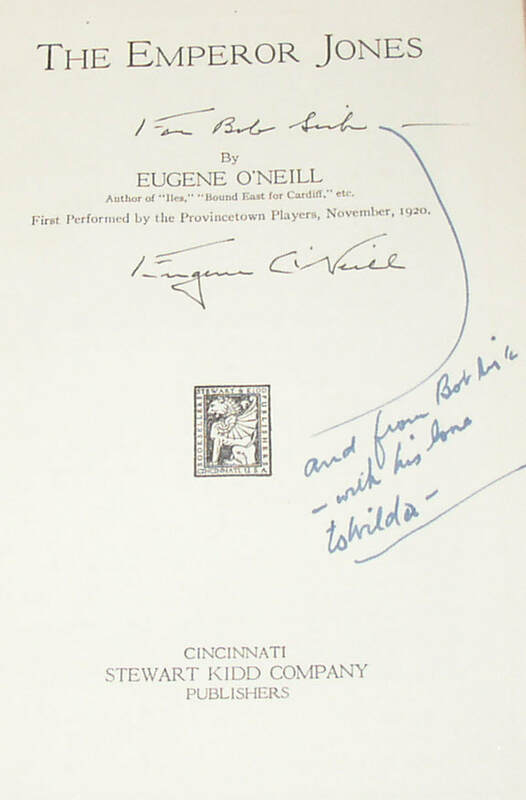 O’Neill has signed it on the title page, with “For Bob Link(? )” and the recipient has added another inscription passing it along to “Hilda.” Very difficult to find signed. Condition: With some soiling to the front cover. A magazine photo of the title character has been laid in, darkening the adjacent pages. Overall, about Very Good. Now in a custom slipcase. 262. 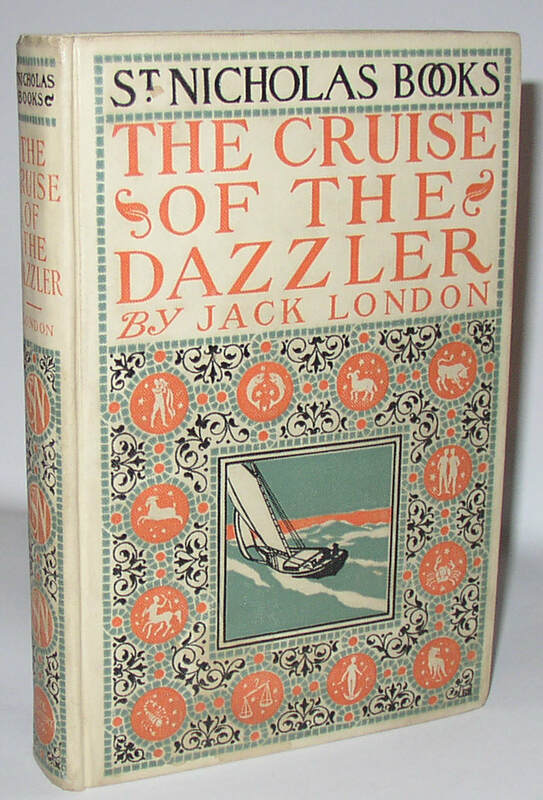 Jack London, The Cruise of the Dazzler, beautiful first book edition. New York: The Century Company, 1902. 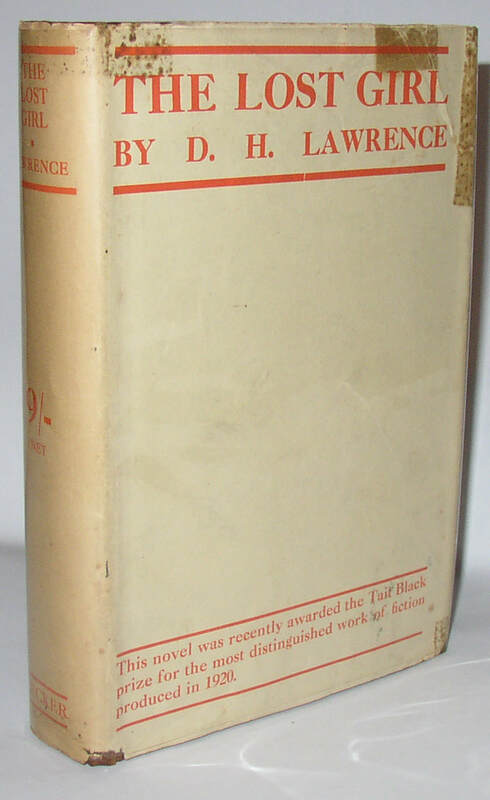 A very attractive copy of this scarce early Jack London book. Highly collectible. Condition: the mildest of wear to the spine, and one little scuff or pencil mark to the bottom page edges. Near Fine. 263. 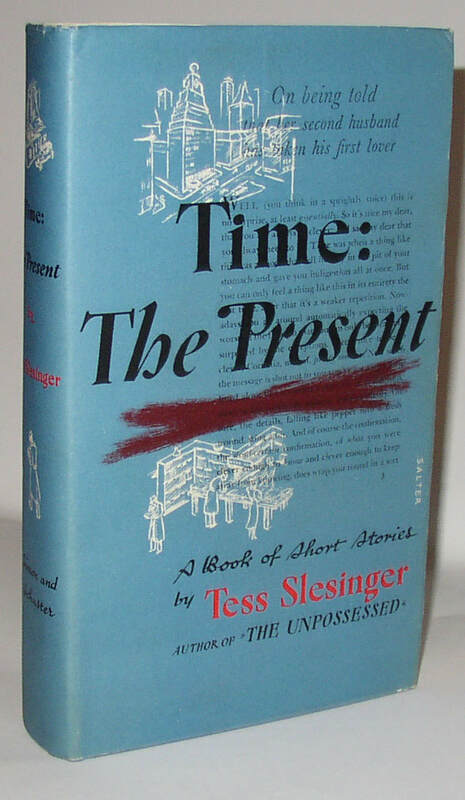 Tess Slesinger, Time: The Present, signed 1st edition in dj. New York: Simon and Schuster, 1935. 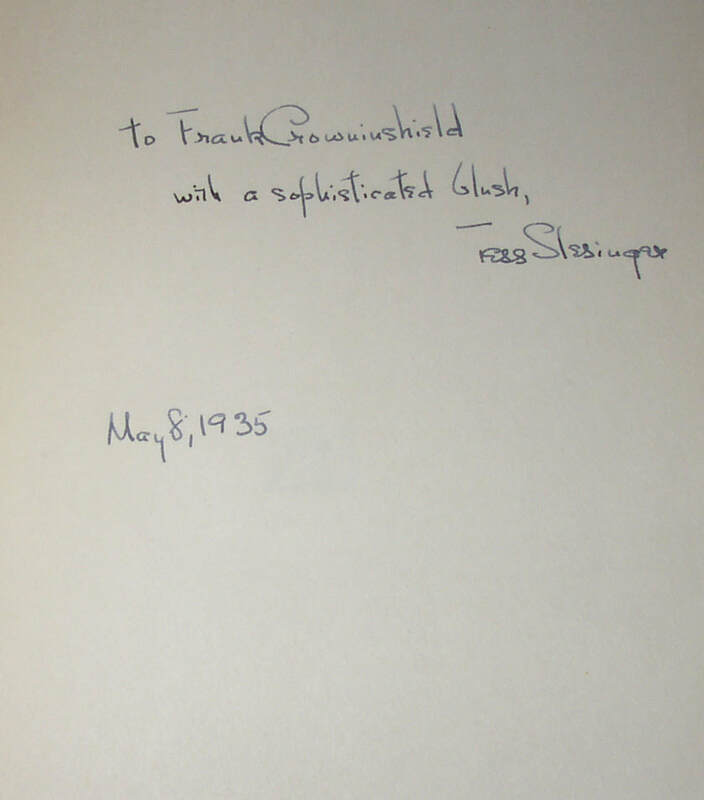 Signed and inscribed on the front free end-paper by Slesinger, “To Frank Crowninshield/ With a sophisticated blush/ Tess Slesinger/ May 8, 1935.” Crowninshiled was the editor of Vanity Fair, where one or more of the stories reprinted in the book was first published. A beautiful copy, with a great association. 264. 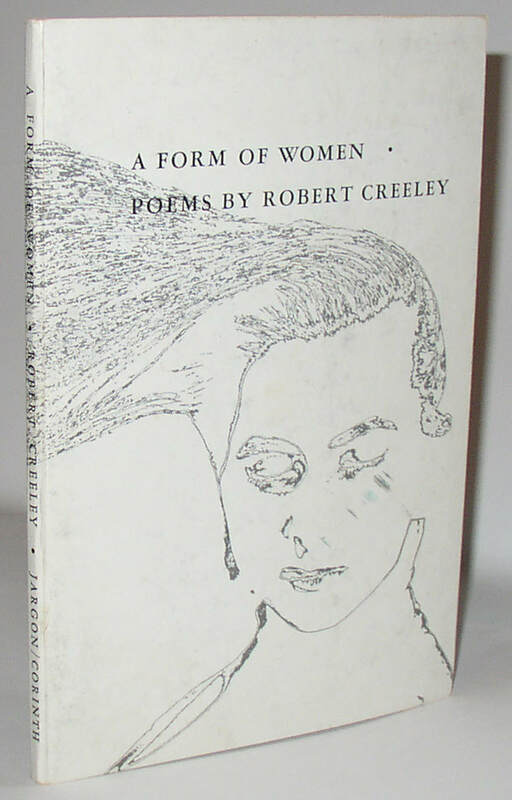 Robert Creeley, A Form of Women, 1st edition signed and inscribed to the poet’s mother. Jargon 33 (1959). Paperback book with a nice inscription to Creeley’s mother, signed “Bob” and dated 1959. Condition: VG, with some bowing to the wrappers. 265. 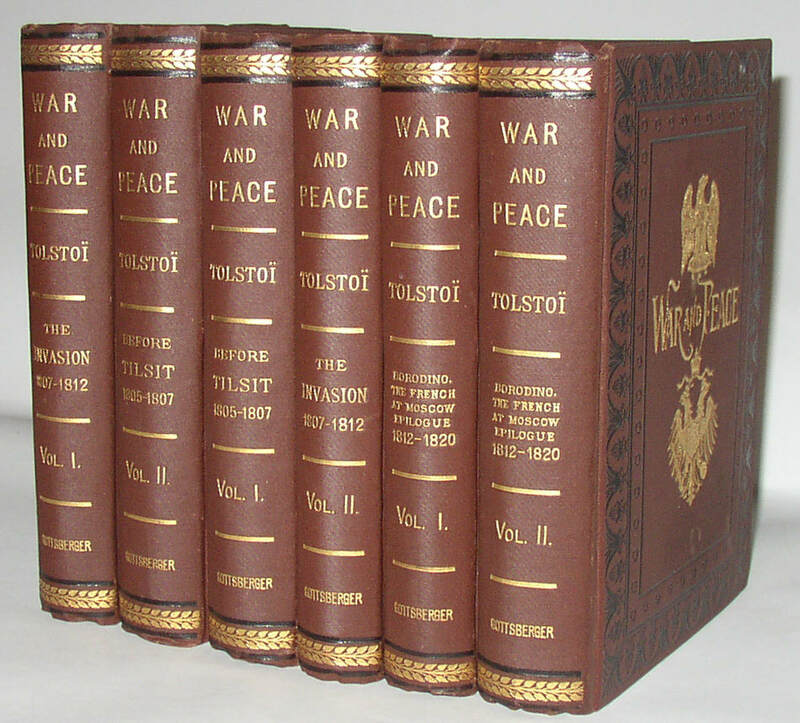 Leo Tolstoi/Tolstoy, War and Peace, US 1st edition, in six volumes. New York: William S Gottsberger, 1886. Translated from French by Clara Bell. A stunning example of what is sometimes called the greatest novel ever written. Minor crumpling at the spine ends, and one gathering a bit loose and standing a bit proud (though still solidly attached) in the first volume. No ownership markings, etc, inside. Each volume has the 1886 publication date on the title page and the Gottsberger imprint on the reverse of the title page. An amazing set. Condition: Very close to Fine. 266. 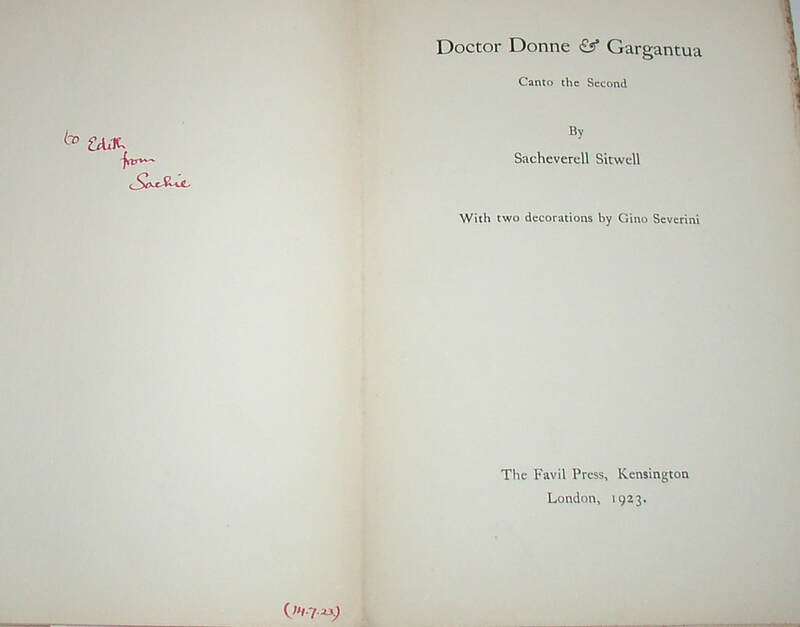 Sacheverell Sitwell, Doctor Donne & Gargantua, Canto the Second, 1st. ed., 1 of 35 copies. London: Favil Press, 1923. 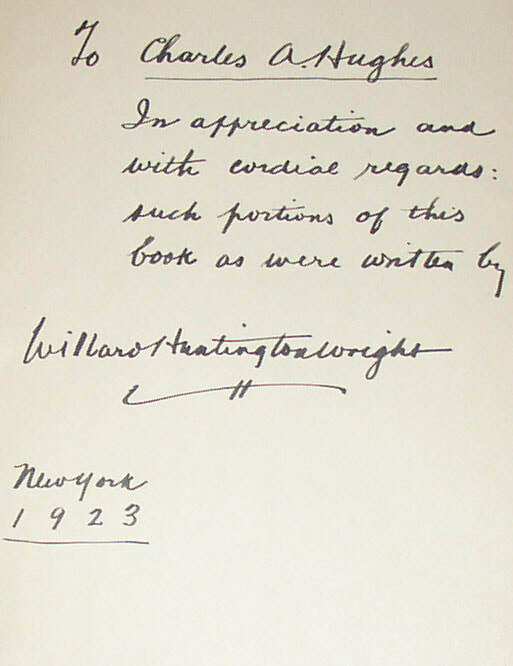 One of only thirty-five copies produced for the author; this one is signed and inscribed to his sister, Edith Sitwell (“To Edith, from Sachie”) and dated in July 1923. Of course, Edith Sitwell was also a notable poet. A rarity. Condition: significant wear and tears at spine and wear to boards. Glue darkening to end-papers. Good overall. 267. 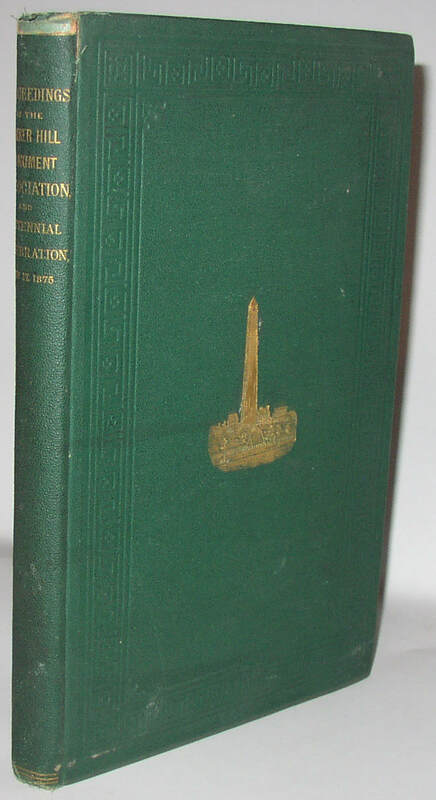 Proceedings of the Bunker Hill Monument Association at the annual meeting, June 23, 1875. Boston, 1875. With an account of the Centennial Celebration, June 17, 1875. Tipped in is a leaf stating “From the Bunker Hill Monument Association, With the Respects of Richard Frothingham, [etc[, Committee. Boston, December, 1875. Also tipped in is a four-page “Order of Services on Bunker Hill June 17th, 1875” for the actual centennial celebration. Scarce. Condition: The top quarter-inch of the spine cloth has perished; otherwise very Good. 268. 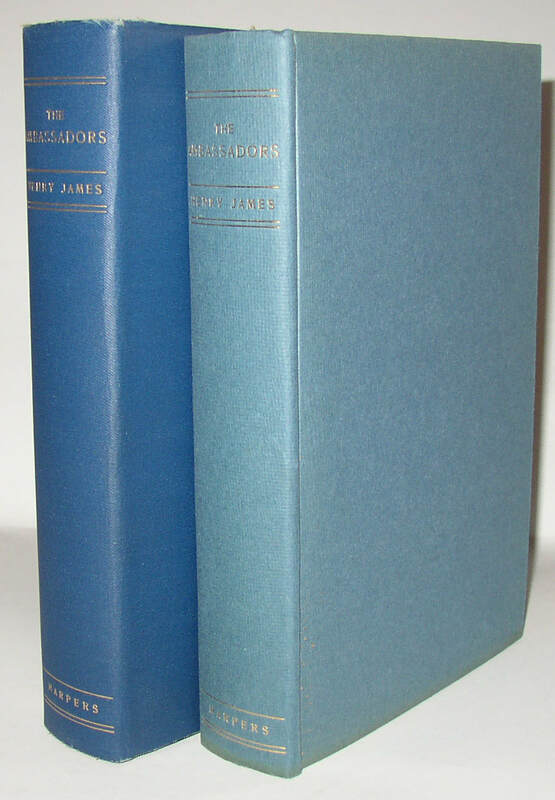 Henry James, The Ambassadors, US 1st edition (1903) in original dust jacket. New York: Harpers, 1903. A stunningly clean copy in a dust jacket that is almost as nice. This sort of cloth jacket is more durable than a paper jacket from this period, but still somewhat scarce. Condition: 1/8” strip at bottom of spine slightly sun-faded on book, corresponding to a similar sized bend or fold at the top of the jacket: the book was shelved with the jacket a bit hiked up. Overall, Near Fine/Near Fine, with minor edge-wear and a couple tiny spots to jacket. 269. 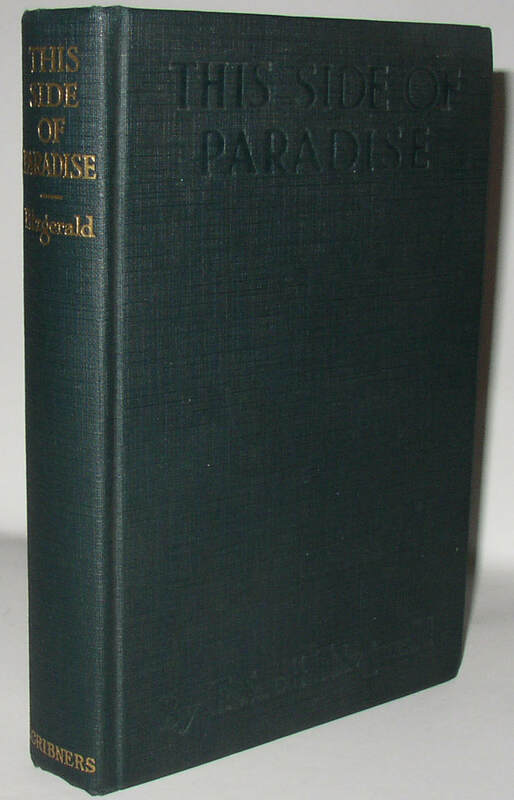 F. Scott Fitzgerald, This Side of Paradise, 1st edition, 1920. New York: Charles Scribner’s Sons, 1920. Scribner’s seal present, and “Published April, 1920” on copyright page with no indication of any later printing, so the true first edition, first printing. A very attractive copy lacking the rare dust jacket, but one featuring a publisher’s flaw: pages 186-87 and 190-91 are blank, without printing. A curiosity. Condition: other than the lack of printing on the pages mentioned, a Near Fine copy; minor bumping at base of spine, perhaps a very slight spine angle. 270. 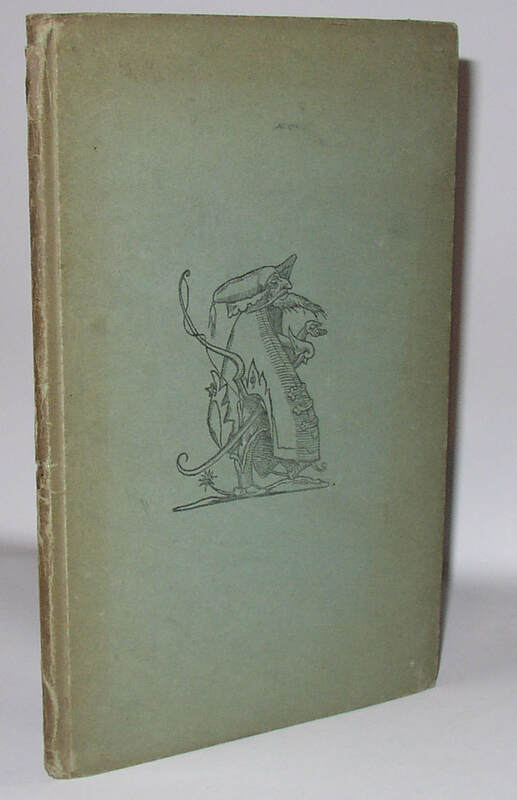 D. H. Lawrence, The Lost Girl, scarce UK 1st edition in dust jacket. Condition: Book is close to Near Fine, with some foxing/spotting to top edge and glue-browning to the end-papers near the spine. Jacket has several pieces of old tape repair to the reverse, with staining now showing through. Some foxing to jacket as well. A couple small jacket chips at base of spine. Now held in folding chemise and slip-case. 271. Robert Lowell, The Voyage and Other Versions of Poems by Baudelaire, signed limited edition. London: Faber, 1968. Signed by Robert Lowell and by the illustrator, Sidney Nolan. This copy is number 82 of 200 numbered copies. 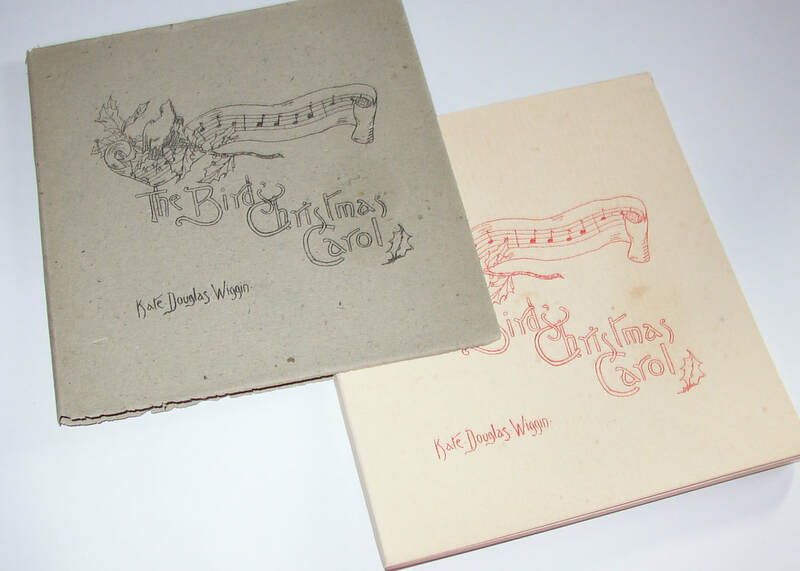 Condition: Fine in Fine slipcase; acetate dust jacket present and undamaged. A clean copy. 272. 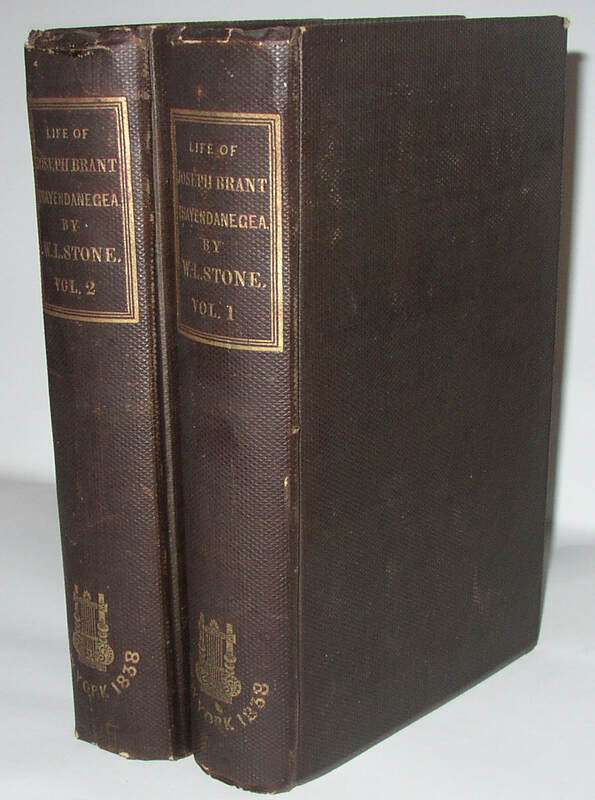 William L Stone, Life of Joseph Brant-Thayendanegea; 1st ed., inscribed by author. New York: George Dearborn and Co, 1838. First edition, inscribed by the author for Mrs L H Sigourney—the well known American author Lydia H. Sigourney—“With the respects of her friend, The Author.” Sometimes described as the best early biography of a native American; collectible in its own right, and especially nice with an author’s inscription to a well known American author. Original publisher’s black cloth with gilt on spines. Two volumes. Condition: some chipping to spine ends and wear-through at board edges; some foxing internally. Near Very Good. 273. 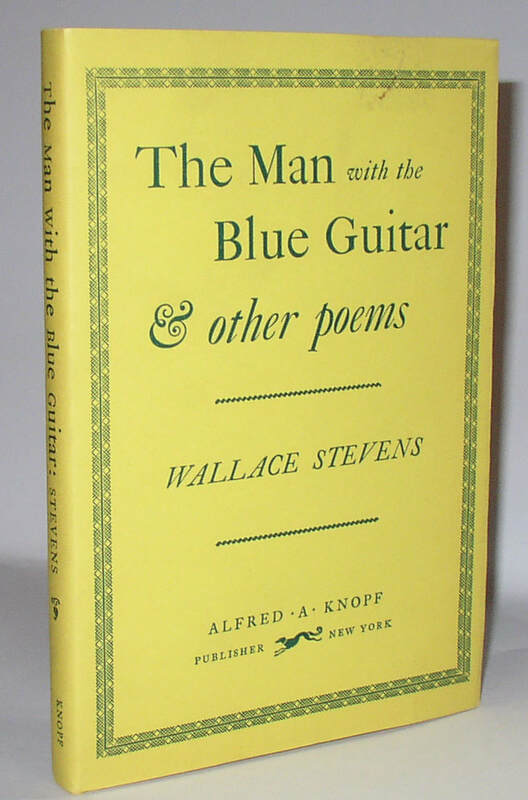 Wallace Stevens, The Man with the Blue Guitar and Other Poems, 1st edition in dj. New York: Knopf, 1937. First edition stated. A brilliant and beautiful copy of this highly collectible book, with only one flaw to the jacket. Condition. Book is Fine; jacket has a 1-inch square piece of old tape to the reverse side of the front panel, securing a 1” long curving closed tear. The tape has discolored and this discoloration can just be seen at the top of the front panel (above the word “with”). Everything else about the jacket is Fine. Still a very beautiful copy. 274. Ernest Hemingway, The Old Man and the Sea. US 1st edition in dust jacket. New York: Scribner’s, 1952. 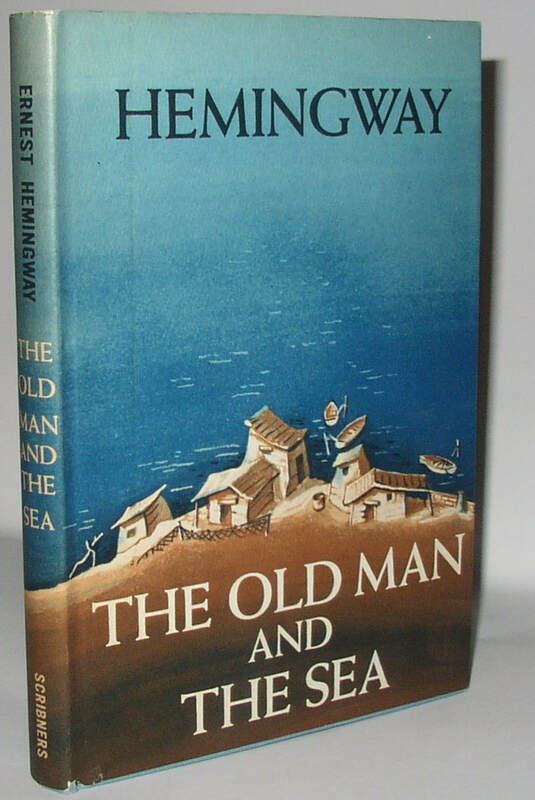 Scribner’s seal and letter A on copyright page, as required; photo of Hemingway on back panel of jacket with the correct bluish tinge. Very attractive copy. 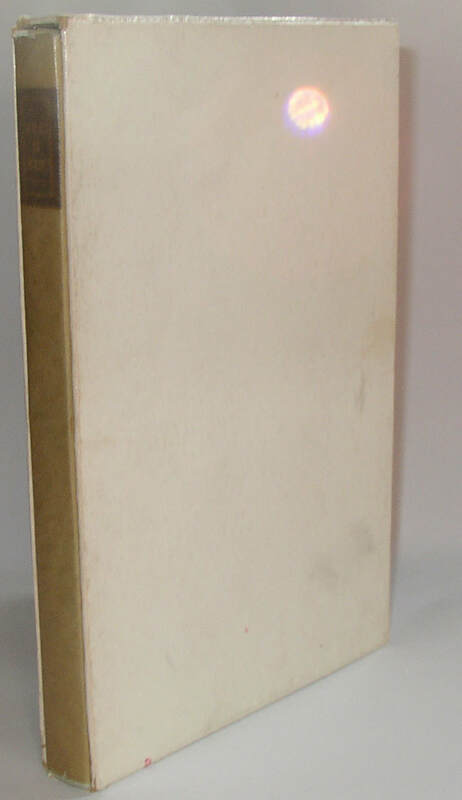 Condition: Book is close to Fine; jacket has some very minor darkening to the exposed edges; two small nicks or chips to the front panel at the base of the spine (the larger about 1/8” by ¼”). Otherwise, book and jacket looking new. 275. 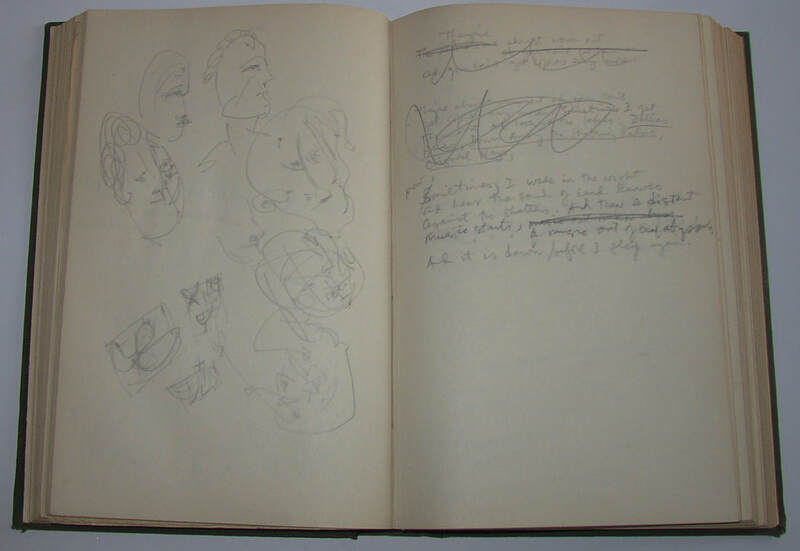 Weldon Kees, blank book filled with drafts of poems and stories, dated 1940. 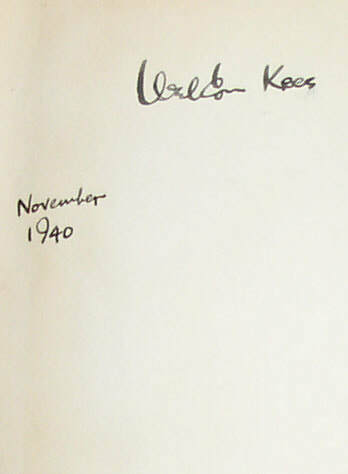 Signed by Kees and dates November 1940 on the front free end-paper. This book include drafts of parts of a lengthy narrative, with chapter numbers ranging from six to fifteen, and one section labeled “Last Chapter”: something around 112 manuscript pages in total. 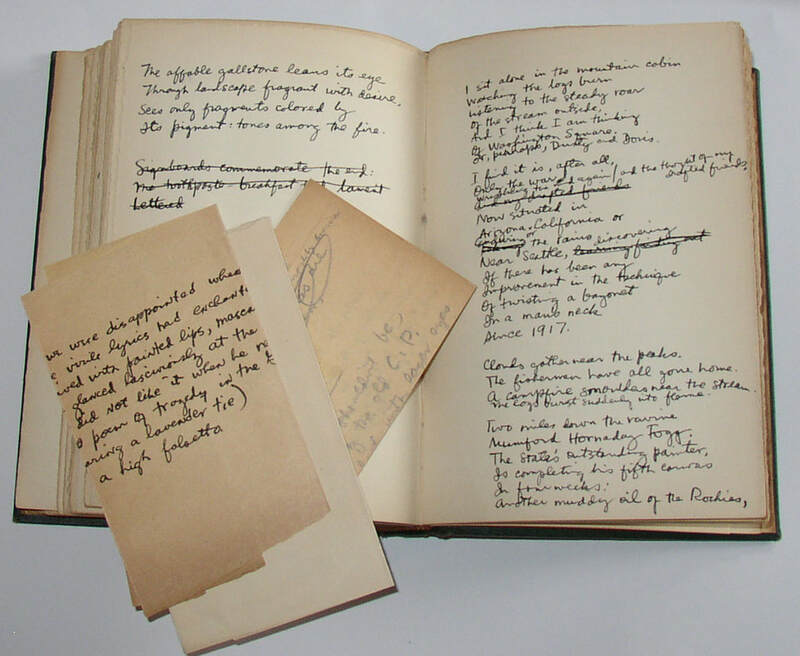 At least a hundred further pages in the manuscript include drafts of poems and a few additional pages of prose; some pages are dated into at least February of 1941. 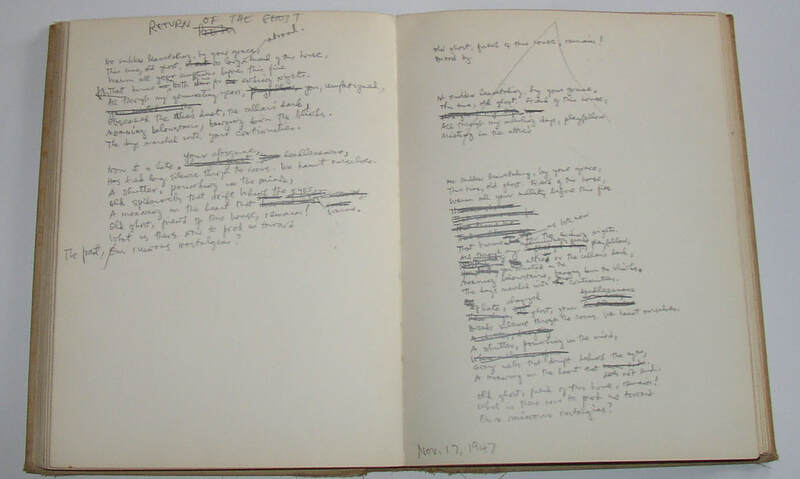 Some of the draft poems are certainly among the poet’s published works (e.g., “Variations on a Theme by Joyce”) others may be preserved only here; Kees’s first book of poems was published in 1943. Several slips of paper with additional drafts or notes are also laid in. Occasional sketches are also present. Condition: with some pages torn out (presumably by Kees); otherwise Very Good. 276. 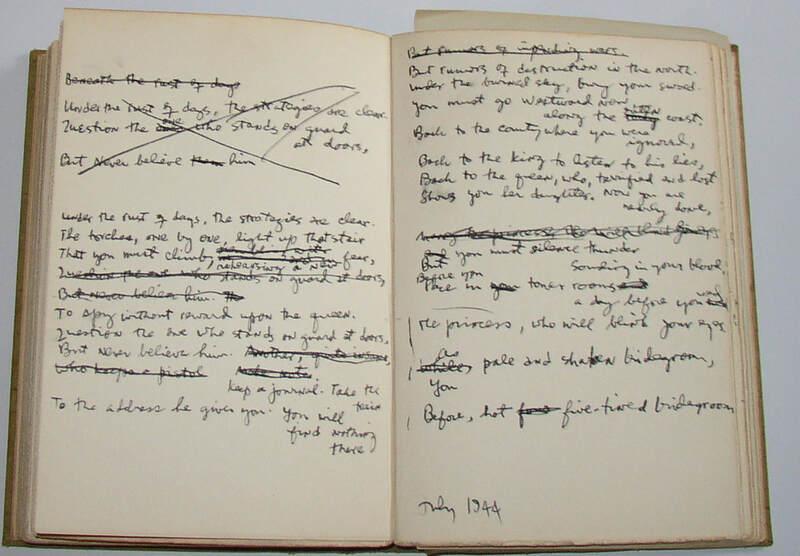 Weldon Kees, blank book with drafts of mostly poems, dated 1 April 1942, with entries to 1944. At least 173 pages of draft materials, sometimes just a line or two, but more often a full page. At the end is list of several pages, perhaps prepared when Kees was moving, listing the contents of eight boxes of books: a remarkable record of at least some of the books in his library. Another short list identifies books loaned out to, among others, “Jim Agee” and R[obert] Duncan, who has apparently borrowed The Big Sleep. 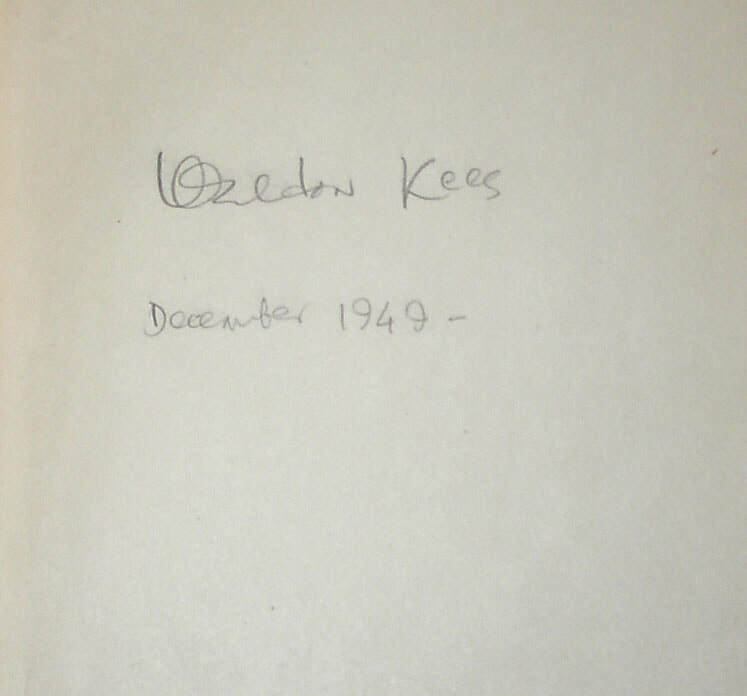 The draft poems, no doubt, are the real treasures here, but the list of Kees’s books is also fascinating. Again, several smaller slips are laid in, generally with draft material or notes. Condition: again with some pages removed, but otherwise VG. 277. 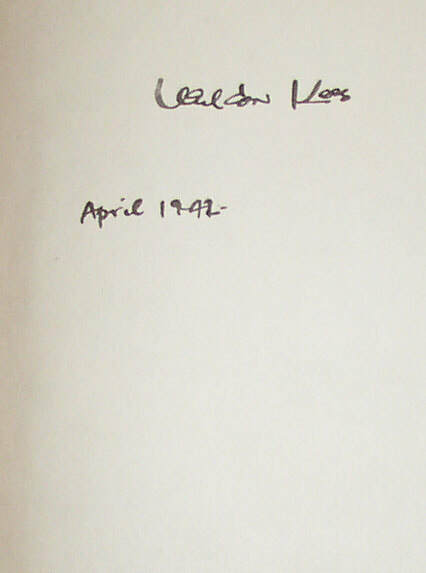 Weldon Kees; blank book filled with drafts of prose and poetry. Also dated April 1942, but with entries dated at least to 1949. This one begins with several pages of draft prose material, but after about 20 pages, poetry drafting takes over. A note at the bottom of one prose item (dated 1942) reads “1947—what this story was to be about I haven’t, now, the faintest idea.” On another page he drafts the acknowledgements paragraph and imagines title pages for a collection of poetry variously titled “Deaths and Passages: Poems 1947-1949” or “Entrances and Deaths: Poems 1947-1949.” As it turned out, his third collection did not appear until 1954. In this book, actual drafts often appear on the rectos, with edits or changes on the facing versos, but this habit is not followed exclusively. Once again, hundreds of pages of material, occasional sketches, some laid in items. Condition: with some pages removed; otherwise close to Very Good. 278. Weldon Kees. Blank book filled with draft poems and journal entries, etc. Dated December 1949 on the front end-paper; one of the last entries being headed “Poems 1955” and including a brief four-line poem dated 4 Jan 1955. Over a hundred pages with draft poems or notes, though again most drafts are on rectos and have sometimes only a line or two on the versos. In 1954, the focus seems to shift to primarily diary or journal entries. Some sketches, once again, and additional materials laid in or paper-clipped to the pages in some cases. Condition: once again with some pages excised, but the remainder in Very Good condition, overall. 279. 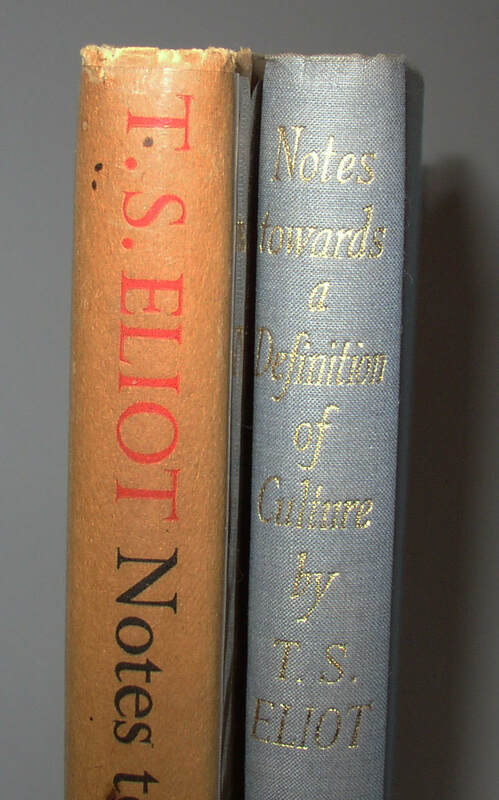 T. S. Eliot, Notes Towards the Definition of Culture, one of 18 copies with error on spine. London: Faber & Faber, 1948. Scarce incorrect pre-publication edition of this book, with the title reading Notes Towards A Definition of Culture in error on the spine. Two typed notes tipped in (the second signed “Morley Kennerley, Faber & Faber; the first initial M. K. in typewritten letters), which indicate that 12 or 18 of these copies were prepared as “advance traveller’s copies” with an incorrect brass used on the spine; the title of the book having been altered in the proof stage, and the binders not told. A very scarce pre-publication form of this book. Condition: Book is Near Fine; jacket, long held inside an acetate wrap, has suffered some wrinkling from the shrinkage of the acetate, but as the jacket has the correct title on the spine, the jacket is not the key portion of this item. Good plus or VG- on the jacket, I think. 280. 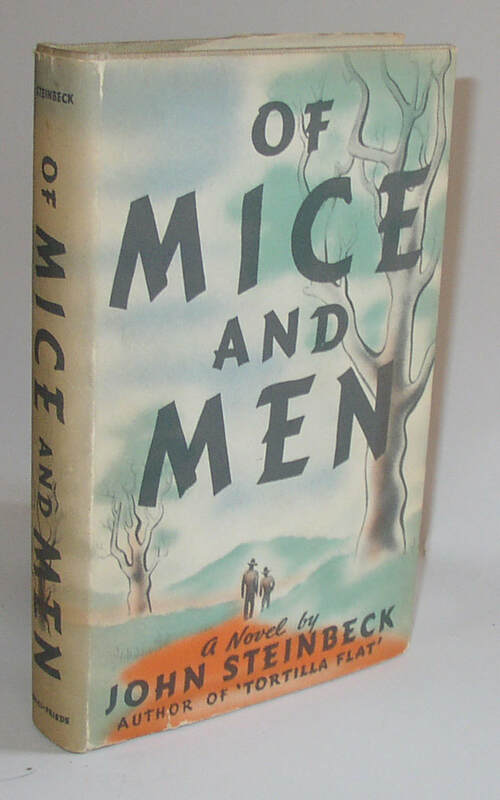 John Steinbeck, beautiful 1st edition copy of Of Mice and Men (1937). New York: Covici-Friede, 1937. First edition of this novel, first printing or state, with the word “pendula” on page 9 and the small dot between the 8s of page number 88. A scarce and collectible book. Condition: Book is about Fine, jacket has some mild surface wear at the edges and corners , and one or two very short closed tears (less than ¼”). 281. 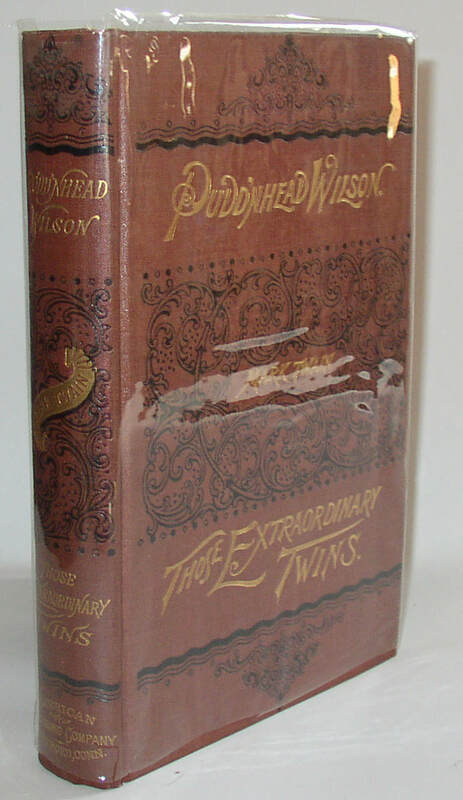 Mark Twain, Pudd’nhead Wilson and Those Extraordinary Twins, US 1st edition. Condition: Near Fine, with very mild wear to the bottom edge. Still a very beautiful copy. Some Duschnes penciling and price on inside. 282. 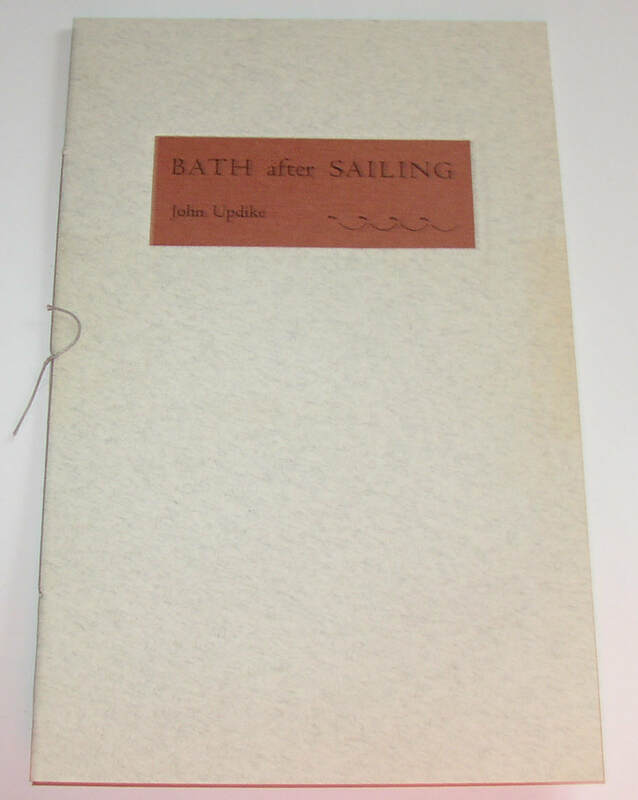 John Updike, Bath After Sailing, scarce signed 1st edition, one of 125 copies. 283. Two US Charles Dickens 1st editions; Edwin Drood and A Tale of Two Cities. 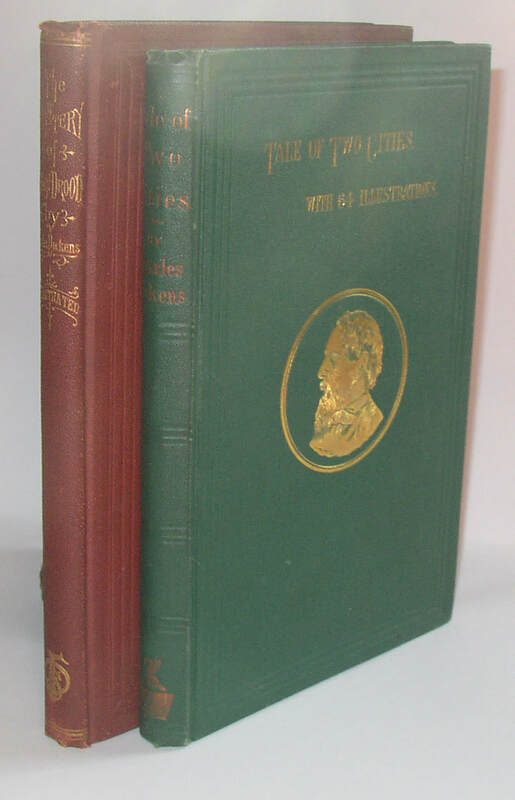 A Tale of Two Cities (Philadelphia: T. B. Peterson and Brothers, 1859). One-volume edition in green pebbled boards with gilding. The Mystery of Edwin Drood (Boston: Fields, Osgood & Co, 1870). Reddish-brown pebbled cloth, with gilt on spine. Condition: Tale in Very Good or Near Fine condition; Drood, with some internal foxing, and with frontispiece nearly detached. 284. 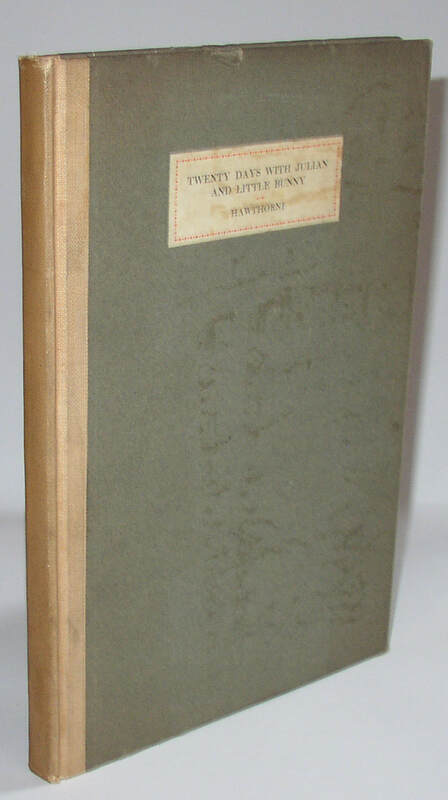 The Story of Naughty Kildeen, scarce US 1st edition in publisher’s box. New York: Harcourt Brace and Company, . By Marie, Queen of Roumania, and illustrated by JOB. One of 1350 copies with the illustrations hand-colored in France. A scarce and beautiful hand-colored book, made even scarcer by being still in the original glassine dust jacket and illustrated publisher’s box, though the box is quite fragile and worn. Condition: Book and jacket close to fine, box with splitting, especially to the lid, and with loss of one corner of the lid. It could use some profession stabilization, probably. 285. 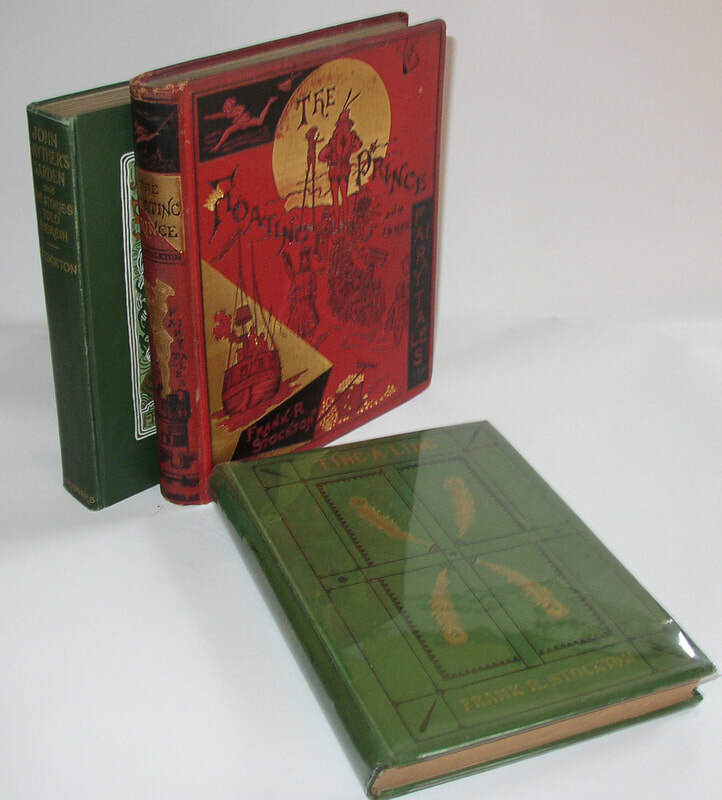 [Mark Twain, Samuel L Clemens], What is Man, limited 1st edition, 1906, in original slip-case. New York, 1906. 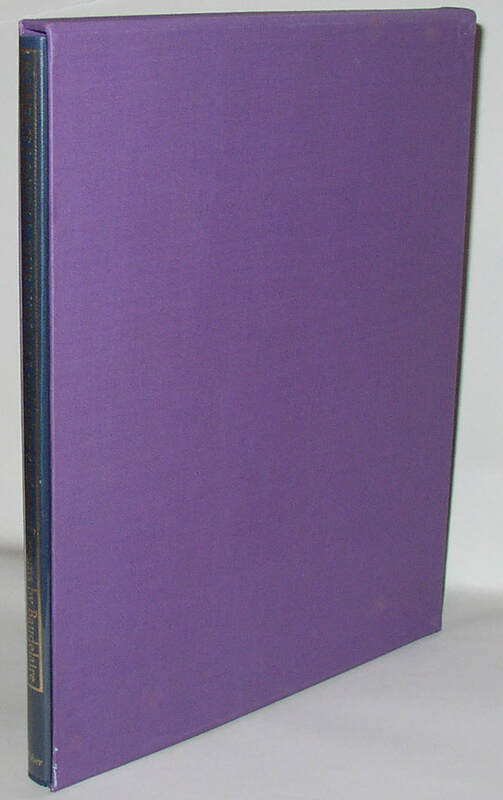 Anonymously published in an edition of 250 copies; this is the apparent second issue, with “thinks about it” on page 131; book and slipcase number “246”. In original glassine jacket and unprinted paper-covered slip case. A scarce Twain item. Condition: Book is close to Fine; jacket has a couple minor losses to the edges, but is essentially complete. Slipcase is starting to split at the bottom of the opening, about 1” and 1 ½”. 286. Four Frank R Stockton 1st editions: Ting-a-Ling, The Floating Prince, John Gayther’s Garden, Lady or the Tiger? 1870-1902. Beautiful first edition copies of these highly collectible Stockton books, each in an attractive decorated publisher’s binding. Condition: Ting-A-Ling is Near Fine (owner’s ink inscription inside); Floating Prince is VG, with some wear to the cloth at the edges, mostly affecting the spine ends; John Gayther’s Garden is close to NF, with an owner’s name and date in ink. 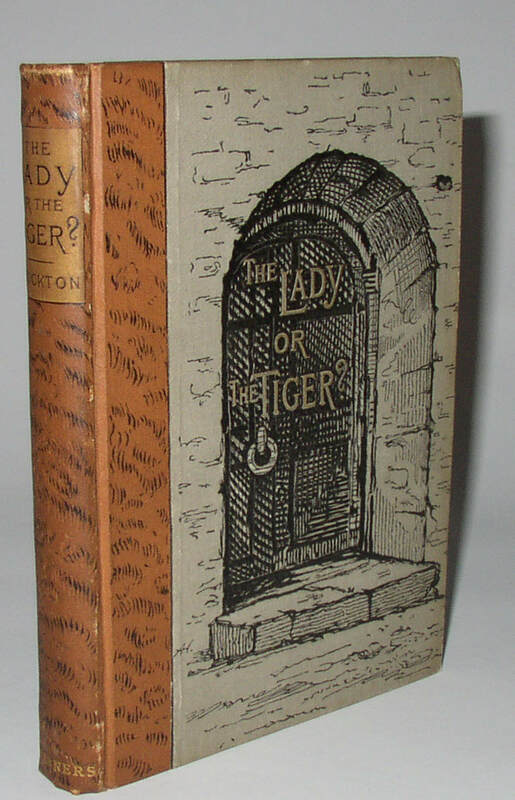 The Lady or the Tiger is about Very Good, with some gentle wear and a bump or two. Some internal browning to cheap paper. 287. Katherine Anne Porter, Noon Wine, signed 1st limited edition. Detroit: Schuman’s, 1937. First edition signed and limited to 250 copies (this being number 46). In original glassine jacket and green paper-covered slipcase. A very nice copy indeed. Condition: Slipcase with a small faded spot or two, otherwise all about Fine. 288. 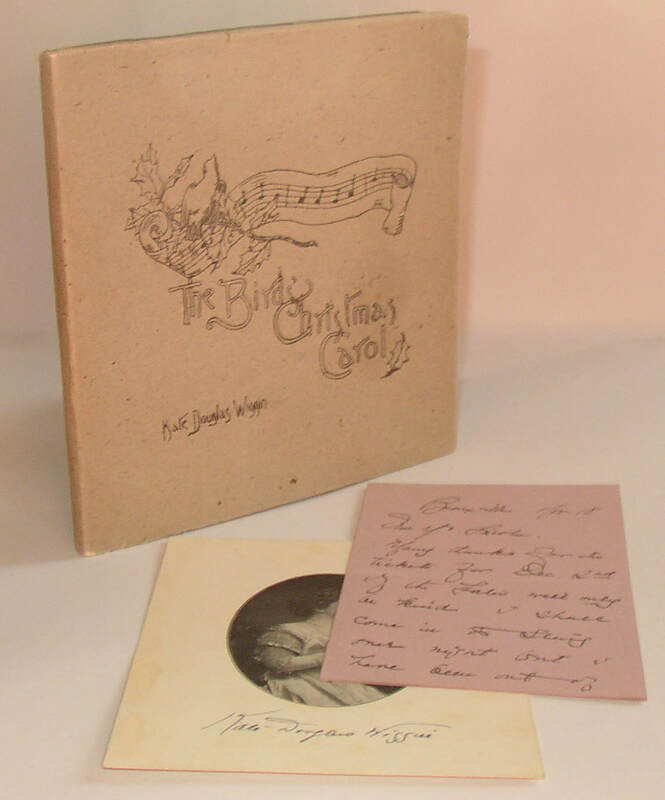 Kate Douglass Wiggin, The Birds’ Christmas Carol, rare 1st edition in original dust jacket. San Francisco: C. A. Murdock and Co, 1887. A small book in the original wraps, very scarce indeed, when accompanied by a beautiful example of the original dust jacket, as here. Also laid in are a signed photo of Wiggin and a signed note by her (undated). A little gem. Condition: Book has minor foxing to the exterior, and is about Near Fine. Jacket is also Near Fine, with some very minor wear to the edges. Wiggins note has residue from having been affixed to an album on the reverse. Minor foxing to photo. All in all a superior little set. 289. 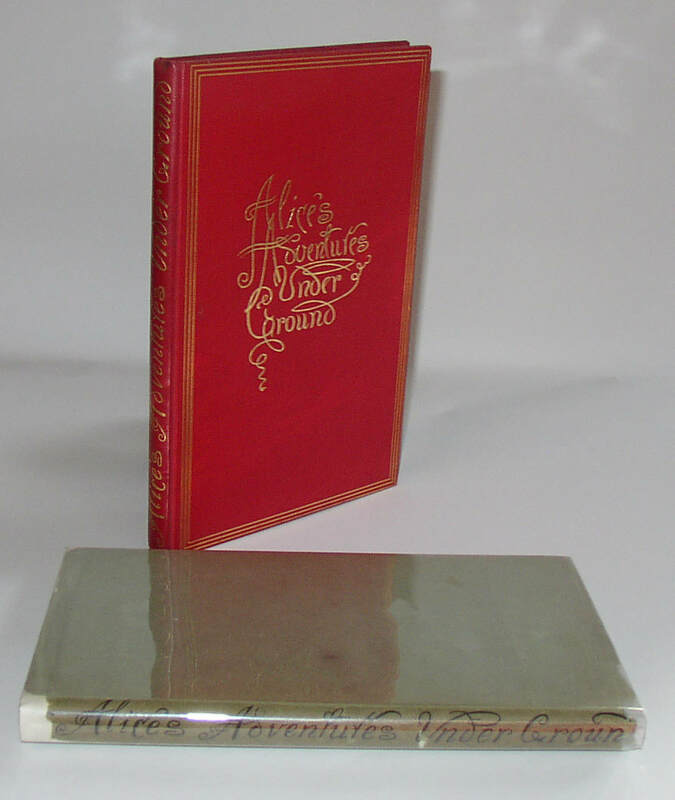 Lewis Carroll, Alice’s Adventures Under Ground, rare 1st edition in dust jacket. London: Macmillan, 1886. After the success of the first Alice book, this earlier version was published, a facsimile of the author’s original manuscript. 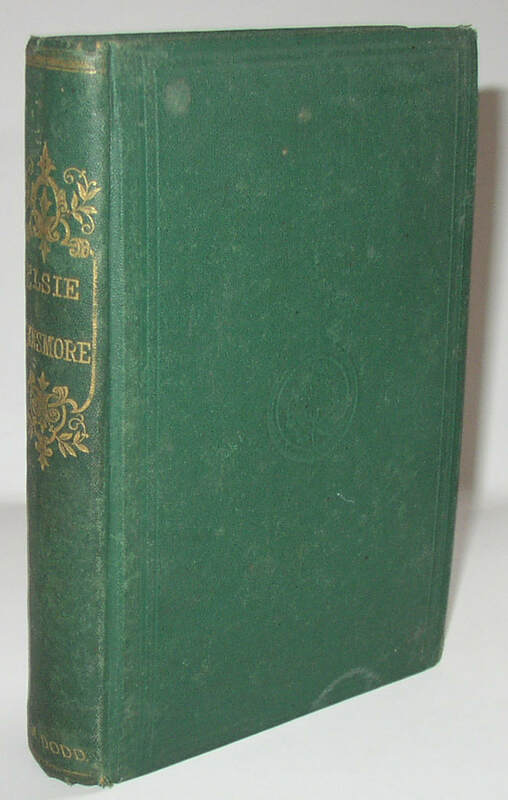 First edition copies are now scarce; this one, although it has the white end-papers usually described as marking a later issue of the first edition, has what appears to be an original dust jacket in late Victorian style with the only printing on the jacket being the title printed on the spine. Very scarce in the jacket. Condition: Book is close to Near Fine; jacket is split at the joint between the spine and the rear panel, and the rear panel has a longish closed tear and some associated creasing, as well as some minor loss at the extremities. Still, a rarity. 290. 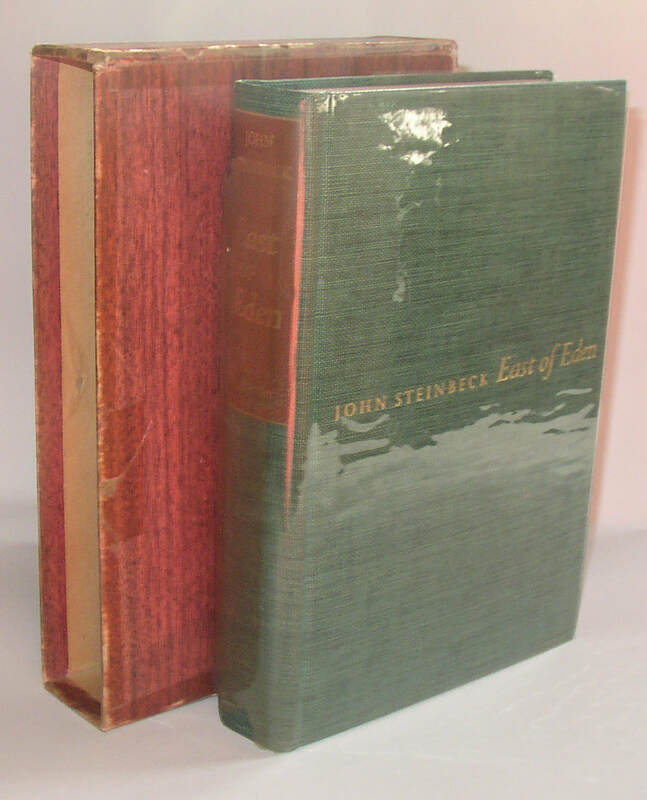 John Steinbeck, East of Eden, limited 1st edition, signed and also inscribed by Steinbeck. New York: Viking, 1952. Signed limited first edition of this classic Steinbeck novel, one of 1500 total copies. 750 copies were for private distribution, and this one appears to have been one Steinbeck himself gave away, as it has his signature on the limitation page and has an additional inscription “For Lem [or Luis? Or ???] and Shirley/ with love/ John Steinbeck” on the front free end-paper. 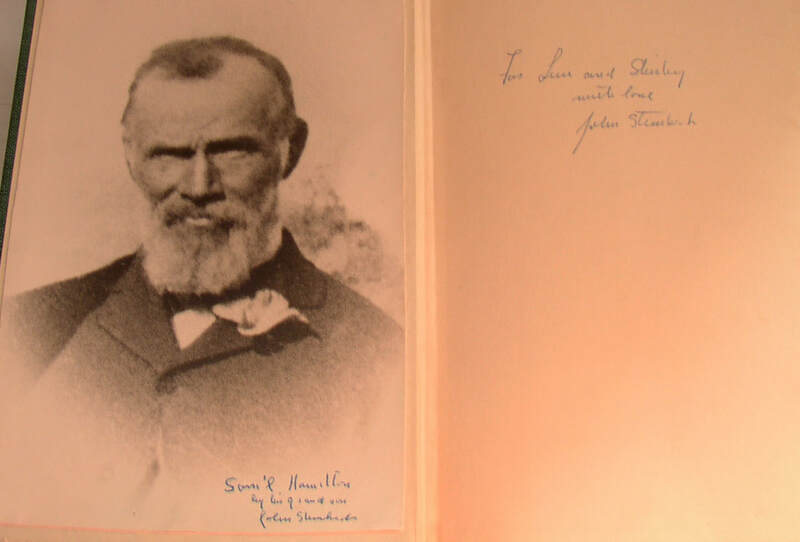 Further, tipped onto the inside front board is a photograph also signed and inscribed: “Sam’l Hamilton/ by his grandson/ John Steinbeck.” With no fewer than three Steinbeck signatures, this is clearly a special copy, and perhaps a unique one. In original plastic dust jacket and slipcase. Condition: Book is Near Fine, with mild thumbing to the fore-edge; plastic jacket has some losses to the spine ends and rear panel. Box has has some amateur tape repair. 291. 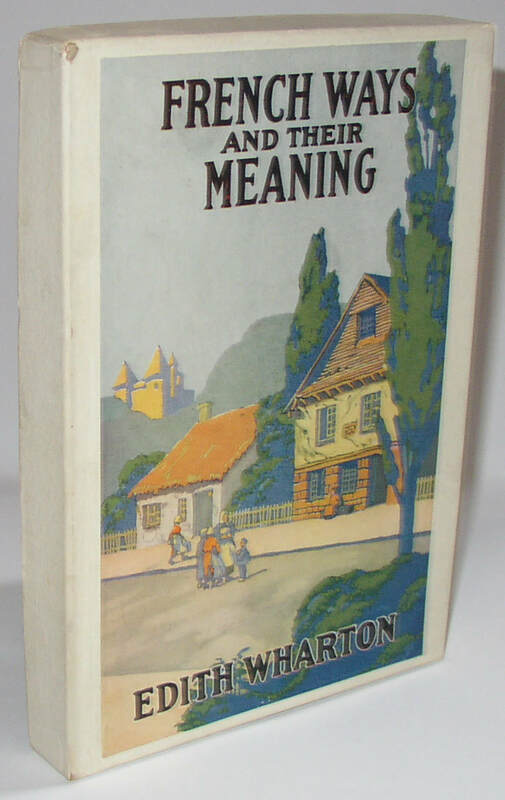 Martha Finley Farquharson, Elsie Dinsmore, rare 1st edition children’s classic. New York: M. W. Dodd, 1867. The rare first book in what would turn out to be a lengthy series of nearly 30 children’s books about the title character. Original green cloth binding. Very difficult to find at all, and very collectible when found in reasonable condition. Condition: Nearly Near Fine, with one half-moon-shaped droplet spot (less than 1”) on the bottom of the front board, and one or two smaller droplet spots elsewhere. Brief non-authorial gift inscription inside; minor wear. Overall VG. 292. 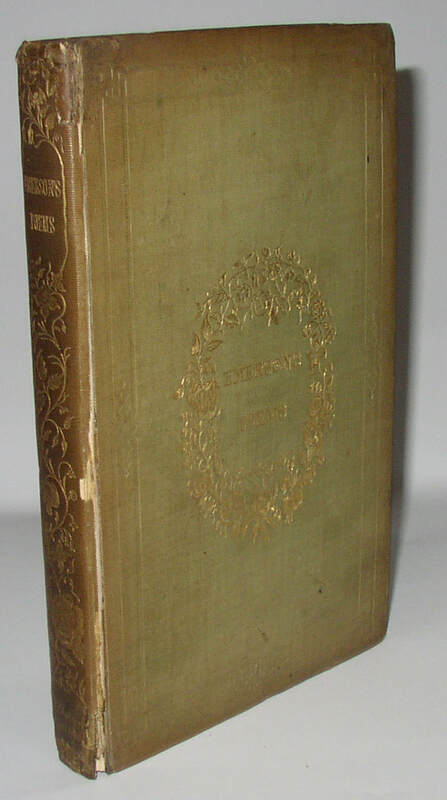 Ralph Waldo Emerson, Poems, UK 1st edition. Unusual state. London: Chapman, Brothers, 1847. This UK edition apparently precedes the US 1st edition of this first book of Emerson’s. BAL says that the 2nd binding reads “J Chapman” at the base of the spine, and that there is an errata slip at p. 1, while the publisher’s catalogue at the end is dated Jan 12, 1848. BAL describes the 1st binding without errata slip and with catalogue dated Nov 16 1846. BAL adds: “A single copy of the book, in this [1st] binding, has been seen with an errata slip; all examined copies of the second binding have the errata slip” This copy has the spine and back cover as second binding; but it has no errata slip, it does have yellow endpapers, and the catalogue is dated Nov. 16, 1846, all as in the first binding. It seems best to describe it as a mixed issue not noted by BAL. Condition: some chipping to the edges of the spine, which has the cloth nearly split at the front joint; some darkening here and there. A bit of damp evident to the very edge of the front free end-page, but to surrounding pages. Now held in a clam-shell case. 293. Lot of John Wieners 1st edition items, including a manuscript poem. 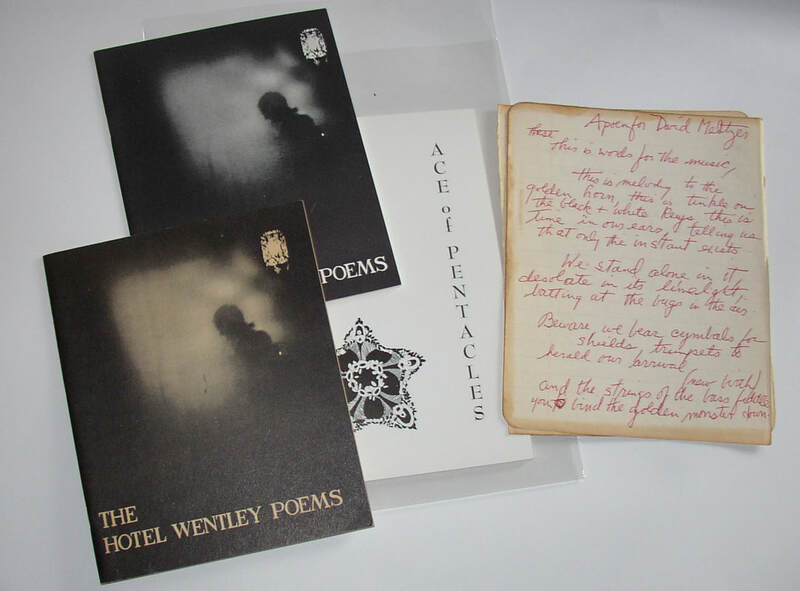 Two copies of The Hotel Wentley Poems, one in each state (i.e., one is first state with the title of one poem not printed in full; the other is the second state with the title present in full); one copy of the wrappers edition of Ace of Pentacles, and one manuscript poems titled “A Poem for David Meltzer” beginning “This is words for the music,/ This is melody to the golden horn.” The poem is 33 lines long on two pieces of lined paper, covering three sides, written in red ink. Wieners has signed the poem. A great little lot from this mid-century poet. Condition: first state of Wentley Poems with some darkening and wear: Near VG; other two books about Fine. Manuscript poem with browning and edge-wear. VG. 294. Weldon Kees ephemera lot, and a 1st edition copy of The Ceremony. 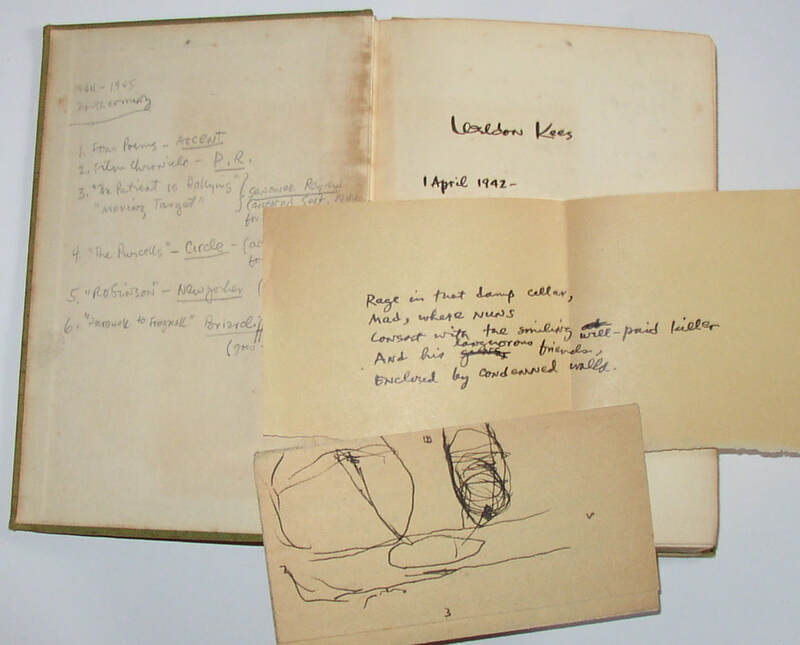 An unusual little batch of Kees material, including a first edition copy of the posthumous collection The Ceremony, this copy being number 277, making it one of just 75 examples on Curtis Rag paper. Also included is a very scarce book edited by Helen Neville and Henry Roskolenko, The Exiles’ Anthology (1940), including some Kees poems, alongside Kenneth Patchen, Julian Symons, Theodore Roethke, and others (stapled in unprinted wraps). Also, 2 copies of the rare broadside for Kees’s “Poets’ Follies of 1955”; one has been folded and mailed (to Jonathan Williams—perhaps the poet, though is was been mailed to an address in San Francisco); the other is as new and unmailed. 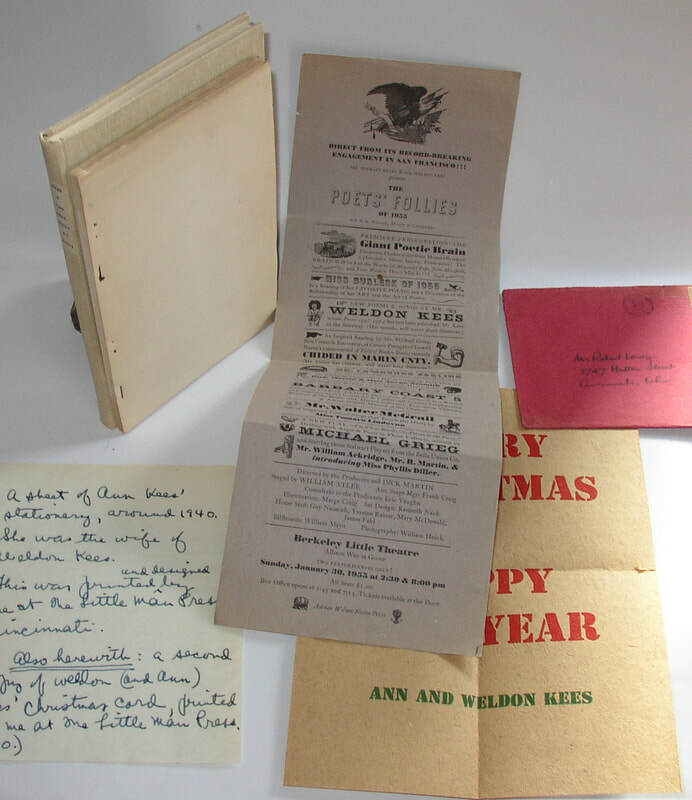 The final item is a copy of the Christmas Card of Weldon and Ann Kees that was printed by Robert Lowry of the Little Man Press in 1940; this copy accompanied by a partial note from Lowry explaining that he printed the card, and also accompanied by the original mailing envelope (addressed in Kees’s hand, I believe) in which Kees and his wife sent one example of the card back to Lowry as their Christmas greeting. A couple of other items mentioned in Lowry’s note, however, are not present. Scarce items. Condition: Varying condition, from Fine (The Ceremony) to worn from mailing (the broadside; the mailing envelope). 295. 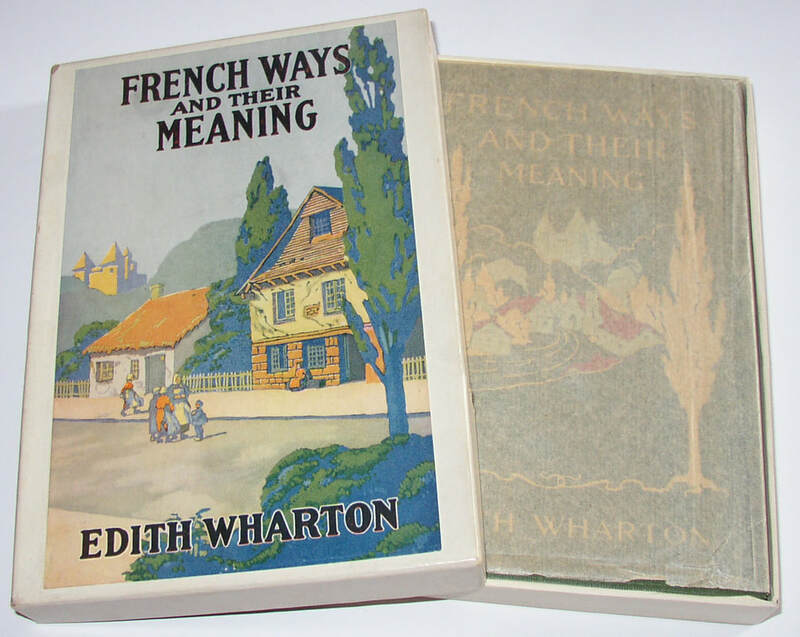 Edith Wharton, French Ways and their Meaning, rare 1st edition in publisher’s box. New York: Appleton, 1919. First printing of this first edition, in a box that looks almost new. Incredibly scarce in the original glassine jacket and box. A real collector’s item. Condition: Book is Fine; jacket has some minor chipping at the edges. Box has one split/tear at the side of the lid, not at a corner. 296. 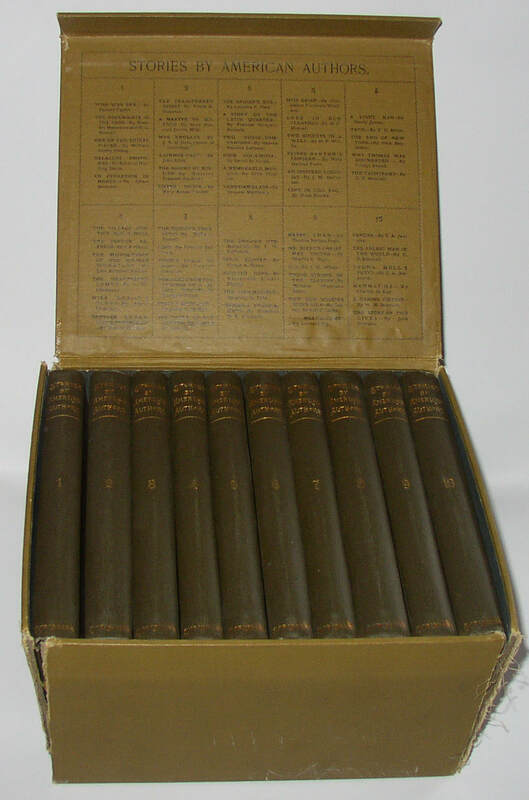 Ronald Firbank, Nearly complete set of first editions, 1905-1932. A truly exceptional collection of Firbank first editions, standing as a nearly complete set of his works of the time, ranging from his first book, Odette d’Antrevernes (1905) to The Artificial Princess in 1934. All of the hardcovers have their original dust jackets, some of which are virtually impossible to find. 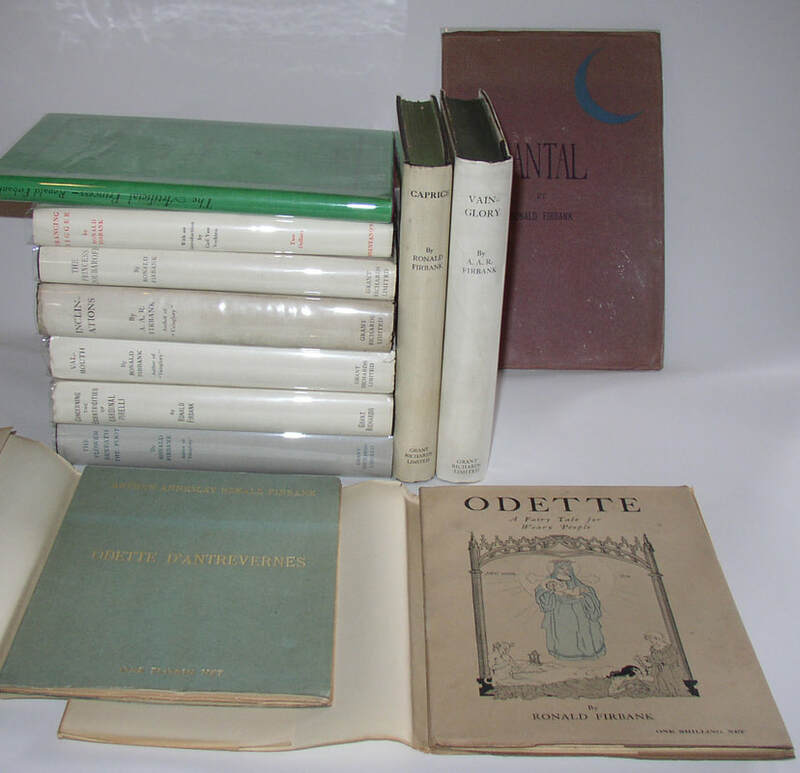 Includes: Odette d’Antrevernes (1905); Odette a Fairy Tale (1916); Santal (1921); The Princess Zoubaroff (1920); and the novels: Vainglory, Inclinations, Caprice, Valmouth, The Flower Beneath the Foot, Prancing, Concerning the Eccentricities of Cardinal Pirelli, and The Artificial Princess. An unbelievable set. Condition: Books mostly near Fine; jackets showing occasional wear or darkening, but generally very, very appealing. 297. 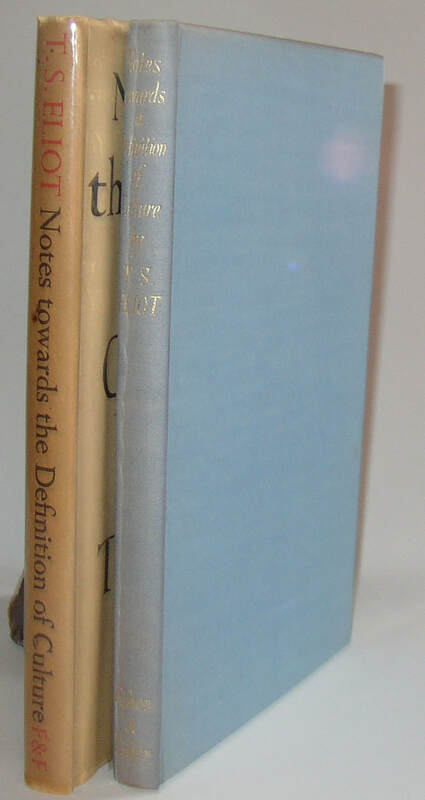 Three Louis Zukofsky 1st editions, two signed by the poet. Includes: All: The Collected Short Poems, 1923-1958. First Edition hardback in dust jacket. 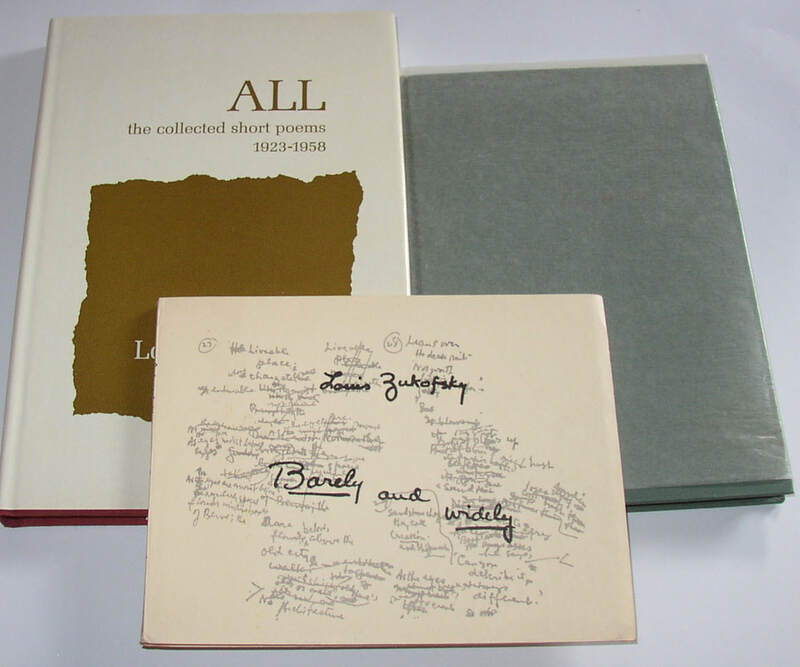 Barely and Widely, number 122 of 300 copies, signed by Zukofsky (paperback); and It Was (1961) hardcover with glassine jacket, number 40 of 50 total signed and numbered copies. A nice little lot fromthis influential poet. 298. 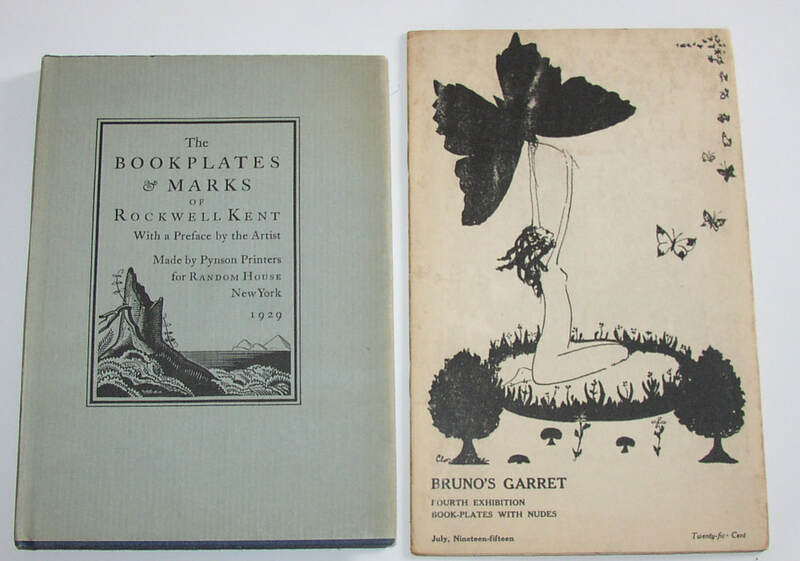 Lot of two books of bookplates; Rockell Kent, And Bruno’s Garret Fourth Exhibition: Book-Plates with Nudes. Rockwell Kent, The Bookplates and Marks of Rockwell Kent (New York: Random House, 1929). First signed limited edition in dust jacket. Number 108 of 1250 copies. A beautiful example. And, a small chapbook from Guido Bruno, dated July 1915, titled Bruno’s Garret Fourth Exhibition: Book-Plates with Nudes, and including several bookplates by Clara Tice. A scarce item. Condition: the Rockwell Kent book close to Fine/Fine, with some wear and darkening to the jacket edges. The Bruno/Tice book unopened, but with some grubbiness to the exterior: VG or better. New York: Privately Printed, 1904. Extremely limited edition, with only thirty copies printed. If I am reading the OCLC/WorldCat records correctly, almost all of these (24or 25 copies?) are presently located in institutional collections; the Rare Book Hub database does not show a copy at auction since 1954. The text is copyrighted by S H Wakeman; this copy with a pencil gift inscription from Stephen H Wakeman to George S Hellman dated in 1909. A virtually unobtainable rarity, regardless. Condition: a bump to the top of the front board; some browning (from glue?) to the front outer board. And despite the tissue guard, there has been a touch of offsetting from the frontispiece to the title page. All in all, Very Good. 300. 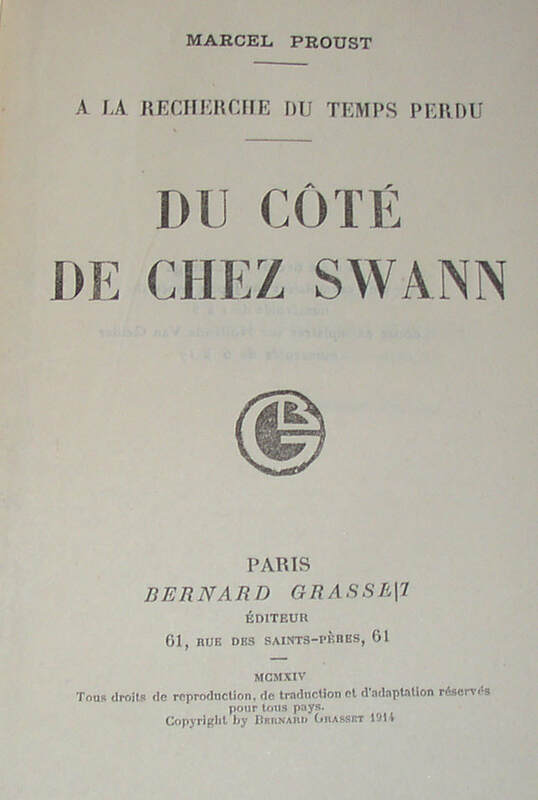 Marcel Proust, Du Côté de Chez Swann [Swann’s Way], 1st edition, 1st state in original wraps. Paris: Grasset, 1913/1914. 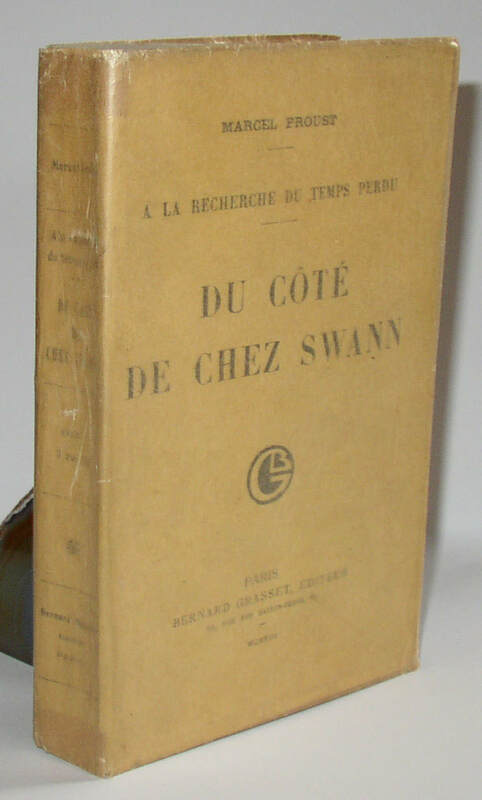 A superb copy of this first volume in Proust’s massive A la Recherche du Temps Perdu (In Search of Lost Time, or as it sometimes appears in English, Remembrance of Things Past). With all the notable points of a first printing: typographic error in the publisher’s name on the title page; title page dated 1914, but front wrapper and printer’s colophon dated 1913; four leaf publisher’s catalogue at the end; no Table of Contents; a blank leaf between the front wrapper and the half-title. Further, where most copies of this book that come to the market seem to have been rebound; this copy remains in its original printed wraps well protected by an (original?) glassine wrapper. A wonderful copy of one of the key novels of twentieth-century literature. Condition: Near Fine, with some wear at the edges and corners. Now held in a stiff chemise and slip-case.